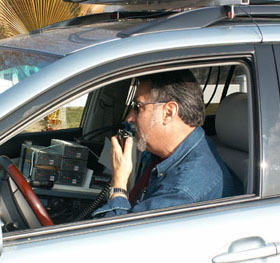 Ever since the advent of the Maidenhead grid square multiplier system in amateur radio, "roving" in VHF/UHF/microwave radio contests has been popular in North America. Under the Maidenhead plan (so named because it was developed at a conference in Maidenhead, England), the world is divided into geographic units one degree of latitude high and two degrees of longitude wide that are identified by four-digit codes such as FN20 (in the U.S. northeast) or DM04 (in Southern California). The system also provides for six-, eight- or even 10-digit codes that can be used to pinpoint a station's location more precisely. The original idea was to facilitate calculations of the distance between two stations for contests with distance-based scoring. That scoring system is widely used in Europe, but in North America the four-digit grid squares are used as multipliers in most contests. The total number of points for two-way contacts is multiplied by the number of different grid squares worked. Because many grid squares have little or no local activity (especially on the UHF and microwave bands), the Maidenhead system encouraged roving stations to travel to various grid squares during VHF/UHF radio contests. What they do is akin to a road rally with amateur radio equipment aboard, and it has enormous appeal to people who might not otherwise operate a VHF contest. Some amateurs spend months planning an itinerary that will take them on a 1200-mile trek through 20 or more grid squares during a contest. And rovers have dramatically increased the activity level in sparsely populated areas, while providing otherwise unavailable multipliers to fixed contestants. Starting when the grid square multiplier system went into effect in the 1980s, N6NB and many others have been roving. The photos here show many of our early and more recent rover installations. Although it's very popular, roving has been surprisingly controversial--for several reasons. For one, questions have been raised about rover operating practices. Many rovers attempt to visit as many grid squares as possible, a practice encouraged by the ARRL rules (which award an extra multiplier for each grid square visited during the contest period). That forces rovers to keep moving, never venturing far off the major highways and rarely stopping to operate with high, directional antennas. If they are to visit as many grid squares as possible, rovers have no choice but to leave rare grid squares quickly and go on to grid squares that are not rare. Some fixed operators say this makes it more difficult to contact rovers in the rare and distant grid squares that they visit, defeating one purpose of roving. There have also been perennial complaints about two other practices: (1) "captive" rovers seeking out only one or a few stations while they're in each grid square and making little effort to be available to the general amateur community; and (2) "grid circling" in which two or more rovers travel together and work each other as they move around a point where four grids converge. Some object to rovers working each other in several grid squares even if they don't engage in "grid circling." Two rovers will often travel together and work each other only once in a given grid square (as opposed to working each other multiple times as first one then the other of them circles around a grid convergence). When rovers travel together, that has been called "pack roving." The rover scoring system has also been controversial. The system has been revised four times, and some rovers are still not pleased with the result. Originally, rover stations scored their activity in each grid square separately. For a time QST magazine listed all of these separate scores and didn't separate out rovers from single operators. The separate scores were very low compared to single operator scores, even if all of a station's scores were added up. Rovers demanded better treatment. The response was a rover scoring system, introduced in 1991, that some have called "megascoring." The contacts and multipliers from all locations were aggregated and the sums were then multiplied, producing much larger total scores. Even though that produced an enormous increase in rover activity, the higher scores stirred controversy, too. 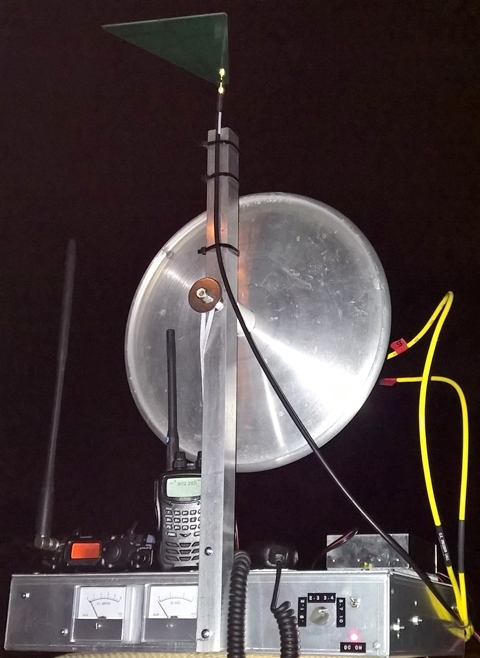 A review of rover participation in VHF contests in the three years before and after "megascoring" was introduced illustrates just how much the recognition in QST and the new scoring opportunities increased activity. In June, 1988, eight (8) rovers submitted logs. In September, 1988, there were 11 rover logs. In June, 1989, 21 rover logs were submitted, with 15 submitted in September, 1989. In June, 1990, there were 20 rover logs, with 13 in September, 1990. Then roving exploded, aided by the new scoring system. In June, 1991, the first with "megascoring," there were 50 rover entries--more than double the number the previous June. In September, 1991, there were 30 rover entries, a 50% increase from a year earlier. In June, 1992, there were 64 rover entries--another big increase. September, 1992, attracted 46 rover logs. In June, 1993, there were 63 rover logs, with 62 in September, 1993--another very large increase. Although roving was booming, some opposed the new scoring system. The high-scoring foursome (Stan Hilinski, KA1ZE, and his son Kevin, NR1L, and Robert Cohen, K1CPJ, and his son Scott, KA1QAS) revolutionized VHF rovering--and demonstrated what was possible. But because their monster scores overwhelmed the traditional club competition, there was an outcry for still another change in the scoring system, although many rovers defended the "megascoring" system by arguing that it made the contests a lot more fun and stimulated activity in many parts of the country. The debate raged at club meetings and conventions, in petition-gathering efforts and on the air. After several years, ARRL reached a compromise: rovers could continue to aggregate their QSO points, but they could count each multiplier only once--with a single additional multiplier for each grid square activated. This resulted in rover scores somewhat more comparable to those attainable by fixed stations. However, it became clear over the years that rovers can still achieve high scores, especially when two or more rovers travel together so they all can work the rare multipliers that they are handing out to others. By roving in tandem and sometimes circling a four-grid convergence, rovers can amass scores that only the top fixed single-operator stations can match. This has enabled some rovers to achieve high scores even in sparsely populated areas where there may be no fixed stations. After the rules were changed a second time, just about everyone thought the scoring record set by KA1ZE's team would hold up indefinitely, but the mark only stood for six years. Operating under the revised scoring system, a team formed out of the legendary Grid Pirates multioperator contest group, signing N3IQ/R, scored 1,391,942 points in the 1999 VHF SS. Operators ND3F and WD8ISK (later K8ISK and then W8ZN) roved in tandem with K8GP/R, operated by K6LEW and KA3QPG, who posted a score of 827,372 points. The two teams visited 15 grid squares and worked each other on an incredible 12 bands--and then set out to work everyone else they could hear in the activity-rich northeast corridor. But their record, too, was broken after only six years--rovers were achieving higher and higher scores. Many other teams of rovers from coast to coast have achieved good scores by roving in tandem. At least seven of the top 10 rovers in 2004 VHF SS traveled with another rover. In recent years rovers in Eastern Washington, Western Washington, Southern California, the upper midwest, East Texas/Louisiana, Rochester, NY and the high plains have all scored 250K or more (often much more) by roving together. This led to still more controversy and another major revision of the rover rules. In 2008, ARRL added two more categories to the rover competition. In the unlimited category, rovers may work each other freely and may even "rove" by operating at two or more fixed stations in different grid squares during a contest weekend. Large groups may also operate together in a bus, for instance, in the unlimited category because the normal limit of two licensed operators per vehicle does not apply. However, unlimited rovers may not participate in the club competition--their scores cannot be counted toward a club's aggregate score. In the classic rover category, rovers may only work any one other rover a maximum of 100 times and may not operate from a fixed station because the rules require that the rover vehicle transport the entire station, including antennas. A third limited rover category was added in 2008. This is a category for rovers who operate on no more than four bands (any four bands at first) with a maximum power that is the same as in the single operator low-power category (i.e., 200 watts on six and two meters). In 2009, the limited category was restricted to the lowest four bands in any VHF/UHF contest. Like classic rovers, limited rovers are allowed to work any other one rover a maximum of 100 times. Classic and limited rovers are allowed to participate in the club competition. The three-category rover system remains controversial, with some contending that rovers can still achieve excessively high scores by roving together. 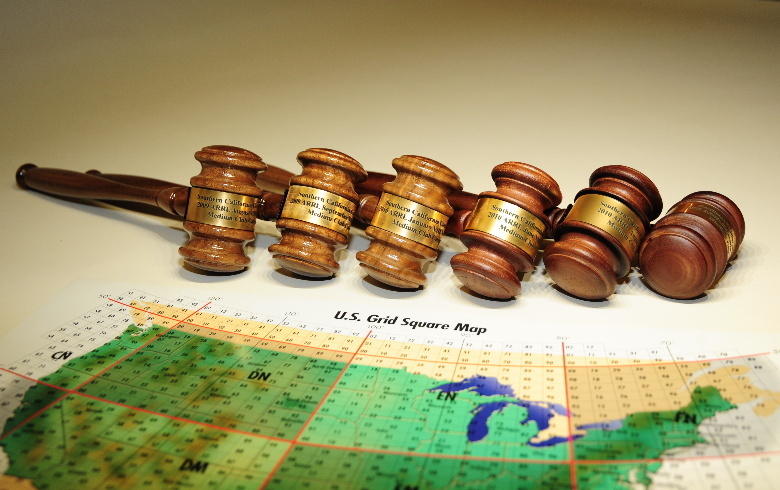 Some have called for still more changes in the rover rules--even a return to the original scoring system where activity in each grid square was scored separately. It remains to be seen how that might affect overall contest activity--and whether the resulting low scores might cause roving to revert to its original status as primarily a means by which some fixed stations could boost their scores. Whatever the pros and cons of the scoring system, rover operating is still popular in VHF contests. The photos on this page show many different rover stations built by N6NB. Building them was a logical outgrowth of building portable contest stations in campers during the 1970s and 1980s. The first portable station, the so-called "Cabover Kilowatt," appeared on the cover of QST magazine in 1971. The first dedicated rover, built around an Isuzu 4X4, was used with good success in the 1990s. Its main innovation was a method of setting up relatively high directional antennas quickly. It took not more than two minutes to go to the operating position with the antenna stack upright (top photo) from the travel position (photo at right, above). The mast was secured to a rotator on the rear bumper of the truck with one bolt. When the bolt was removed, the mast tilted forward into a cradle on the truck. Then a coaxial cable and another bolt were removed to slide the 6-meter antenna off the mast and into a rooftop cradle. For optional high power operation, starting a gasoline generator took another minute or two. This installation worked well for someone who wanted to go to just a few grid squares and spend considerable time operating in each one, perhaps from a superior off-the-highway location. That allowed more people to contact a few rare grid squares, but it made it impractical to visit 15 or 20 grid squares during a contest. In the June, 1998 VHF Contest, the N6NB/N6MU team had the top score on the west coast, but we only visited eight grid squares. The second rover station, used during the early and mid-2000s, utilized a Ford E350 15-passenger Supervan with all but the front seats removed. 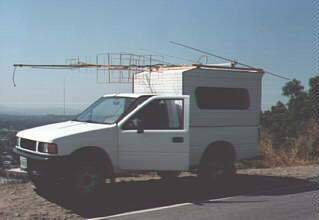 Its antenna system was similar to the one on the Isuzu but with a longer mast to take advantage of the greater length of the van. That permitted excellent separation between antennas for various bands, minimizing interaction. 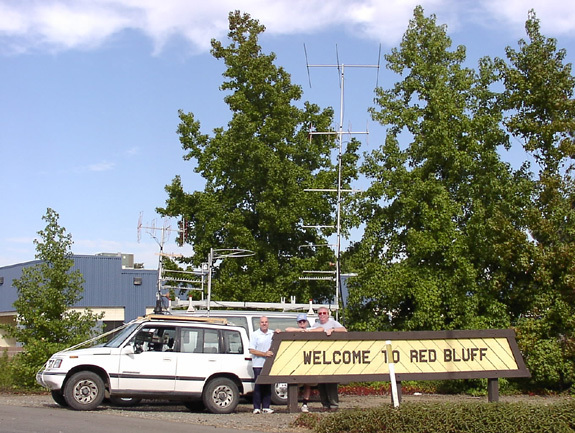 This rover station made its debut during the 2003 January VHF SS Contest on the east coast. The van was driven from California to the northeast and back just for the contest--a 6,500-mile trip that may rank as the longest roving expedition ever in total miles driven to rove in a VHF contest. In the photo here, the van is shown at an overlook on Interstate 80 near Hackettstown in western New Jersey (FN20). Was it worth a 6,500-mile trip? Any dedicated amateur radio contester knows the answer to that question! It was also a sentimental journey--N6NB/1 on Mt. Equinox, VT, set national scoring records in the June and September VHF contests as a single operator in 1979-1980. The E350 van shown in these photos was replaced in 2008 by a new E350, which was configured similarly. The new van appears in some of the later photos. 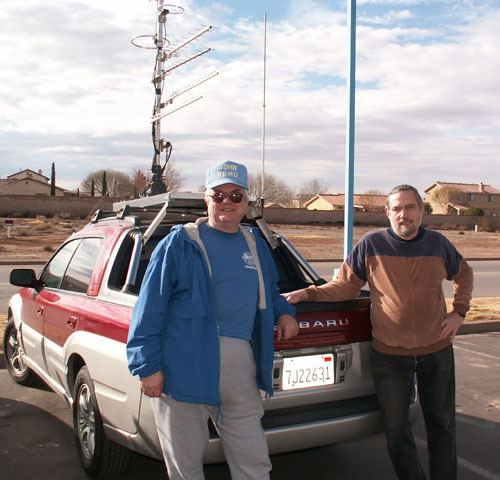 The photos immediately below show the N6NB/N6MU tandem roving team in the September 2003 VHF Contest, the first of many contest expeditions by a growing group of rovers, many of them members of the Southern California Contest Club. 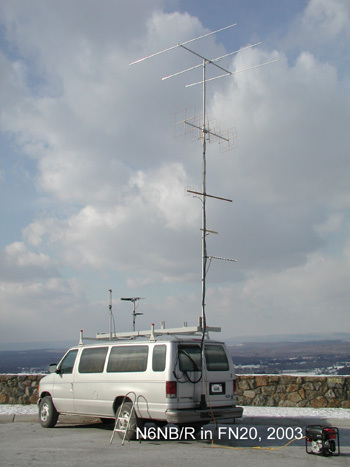 In 2003, one 10-band station was installed in the Ford van and another 10-band station was installed in an SUV. Later that year a third 10-band station was built for use in several different vehicles..
Further down this page there are photos of the first three-rover operation in January, 2004. It produced a combined score of more than three million points, with N6MI/R, N6MU/R and N6NB/R each topping a million points. 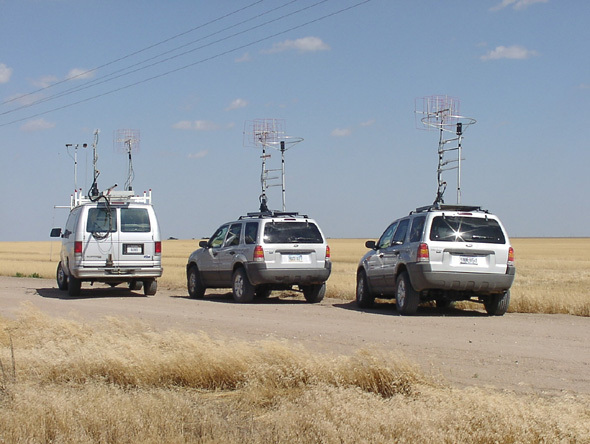 There are also photos of the June, 2004 "high plains expedition," during which three 10-band stations roved through 20 grid squares ranging from Midland, TX to the Nebraska border, with N6NB setting a new June record of 1.29 million points. 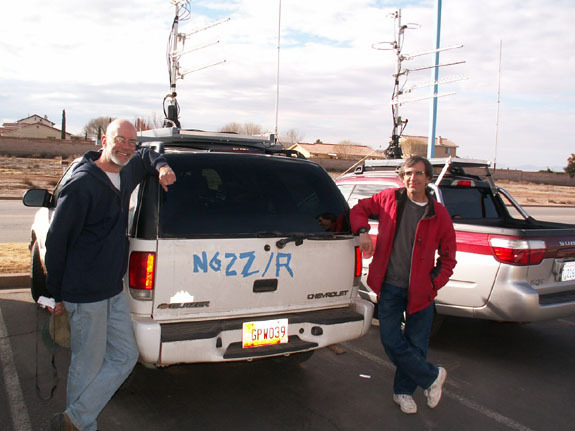 Further down there are photos from the January, 2005 Contest, when N6NB/R (operating with W6XD), N6ZZ/R (with N2IC) and N6MU/R (with K2MM) visited 22 grid squares in New Mexico and west Texas, scoring more than two million points each for another record. Altogether, N6NB/R activated 52 grid squares from coast to coast between January, 2003 and January, 2005. 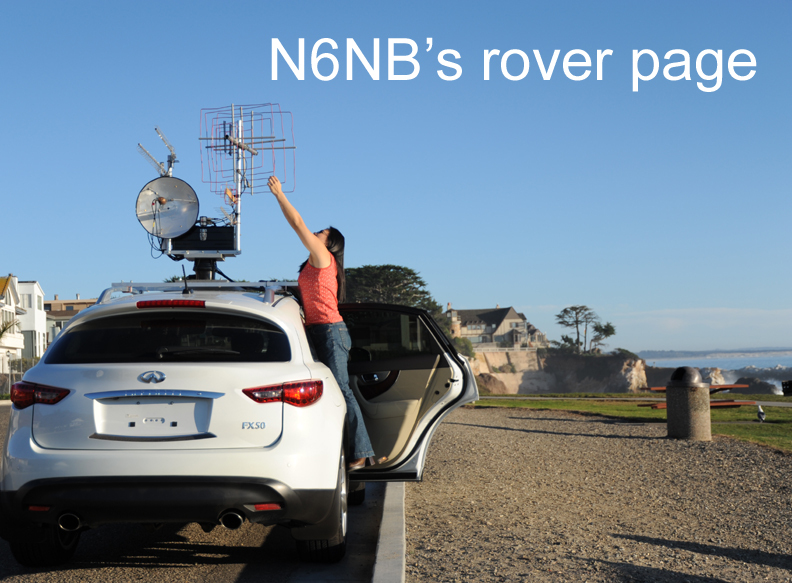 As the rover building-boom continued, the N6NB rover fleet grew to eleven (11) different 10-band rover stations, most of them housed in large toolboxes that could be mounted on a rotor atop a roof rack on any SUV. There is a separate page on this website describing the toolbox stations. As the rover capability grew, the Southern California Contest Club began competing in the ARRL club aggregate competition and winning club gavels--something that no west coast club had done before. N6NB, N6MU and sports car rally driver Rob Hughes (left to right) pose in CN80 with the two rover vehicles used in September, 2003. Having a seasoned rally driver along made a huge difference in our pace. N6NB/R and N6MU/R finished first and second nationally. Rob later became KG6TOA. In this photo, taken by Rob Hughes (KG6TOA), the N6NB rover van is silhouetted against a desert sunset in DM15, with the Tehachapi Mountains in the background. 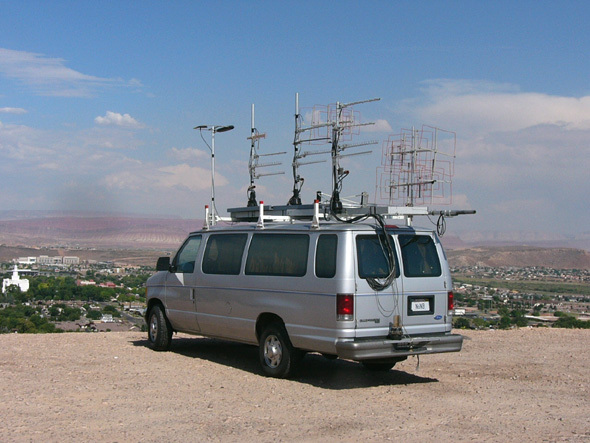 N6NB's non-portable contest station was on the mountain ridge just to the left of the van. 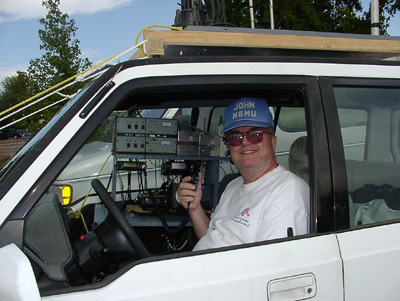 Here's John (N6MU) in his car, which was converted into a rover vehicle at the eleventh hour before the 2003 September VHF contest. This 10-band station included two FT-100D transceivers, a 222 MHz FM transceiver and transverters for 903, 1296, 2304, 3456, 5760 and 10368 GHz. On the roof there are directional antennas on a G-800SA rotor for all bands except six meters (where a loop is on a separate mast). 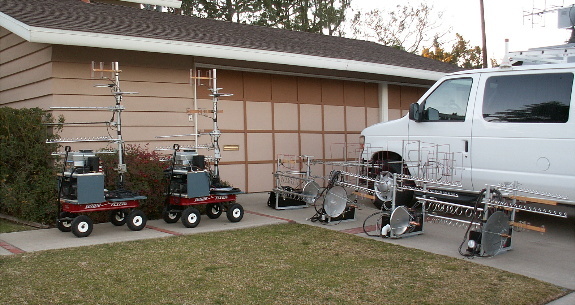 In January, 2004, the rover team grew to three 10-band stations, shown here in CM99. At left is the Isuzu Rodeo used by N6MU/R, with driver Bill Reese beside the car. In the foreground is the Ford Explorer used by N6MI/R. Behind it is the van used by N6NB/R and KG6TOA. Each of the three rover stations scored more than one million points in the 2004 VHF Sweepstakes. 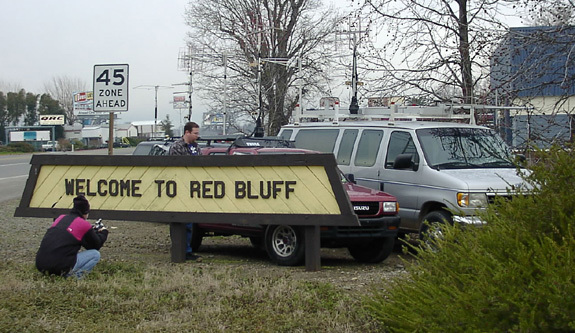 After the contest, the group did another photo session at the Red Bluff sign in CN80, this time with three vehicles. In the foreground, Scott Bovitz, N6MI, shoots video of the scene as Bill Reese stands beside the Rodeo used for rover station #3. Before the contest began, the group posed at N6NB's house in Tustin, CA (DM13). From left: Wayne Overbeck, N6NB; Rob Hughes, KG6TOA; John Desloge, N6MU; J. Scott Bovitz, N6MI; and Bill Reese. In June, 2004, we roved from Midland, TX northward through the high plains to western Nebraska, activating 20 grid squares. Here the van and two rented Ford Escapes are parked together for a photo opportunity beside a cornfield near Dumas, TX at the convergence of grids DM85, DM86, DM95 and DM96. We drove the van from the Los Angeles area to Texas before the contest and rented the two Escapes in Midland, outfitting them with 10-band rover stations that had been hauled from California in and on the van. N6NB and KG6TOA roved in the van, while N6VI used the Escape in the center and N6MU the Escape at right. Rancher Brooks Brown, who owns about 1,000 acres at the DM85-DM86-DM95-DM96 convergence, stopped by to say hello. He was delightfully hospitable, but he suggested we were pushing our luck by using three Fords for the expedition. The red truck at left is his. We stopped among amber waves of grain for this photo opportunity near Jetmore, KS, at the convergence of grids DM97, DM98, EM07 and EM08. The farm roads in the high plains turned out to be surprisingly good. A few hours after this photo was taken, our three stations were in Nebraska after a successful 800-mile run through 20 grid squares during the contest. N6MU, N6NB and N6VI all had scores over a million points, unprecedented for rovers in the June contest. KG6TOA took this photo of the van on a hill overlooking St. George, Utah, near the end of the 4,000 mile trip to the midwest and back. 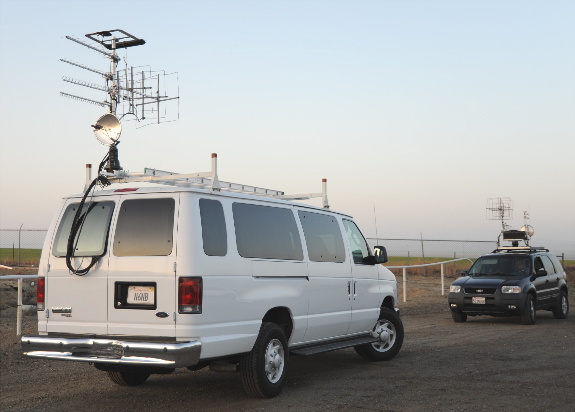 The van is carrying three complete 10-band antenna systems, 12 transceivers, 15 microwave transverters and an assortment of amplifiers. These scores are directly attributable to the talents of the seasoned contest operators who joined us for this venture. It quickly became clear why they're so successful in HF contests. One of the highlights was spanning some seemingly impossible paths, working over high hills on 10 Ghz. Another was working W5LCC 27 times from seven grid squares, including Qs on 1296 from five grid squares. And we worked K5RHR 15 times (thanks for making Lubbock and Albuquerque so workable, guys). This photo was taken just after we arrived in Alamogordo, NM. N6ZZ's Blazer had not yet been outfitted, but that would soon change. Here are N6MU (left) and K2MM ready to go on Saturday morning just before the contest. N6ZZ (left) and N2IC operated in Phil's Blazer, now outfitted with antennas for 10 VHF+ bands. 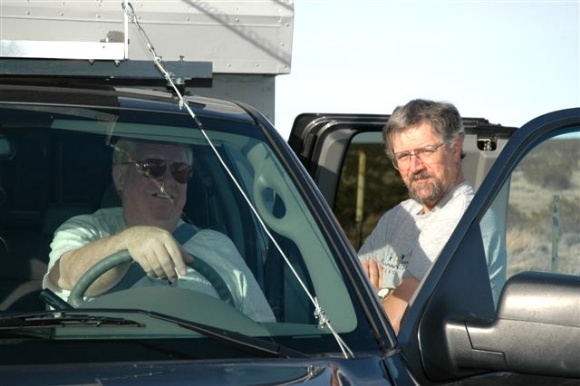 For N6NB (left) and W6XD, who operated in the van, this contest was notable in another way: it marked the first time in 20 years that neither of them was attending an ARRL Board of Directors meeting during the weekend of the January VHF contest. Both had been there/done that and were happy to leave that responsibility to two other contesters, N6AA, the new Southwestern Division director, and AA7A, who served as vice director from 2005 until 2008. 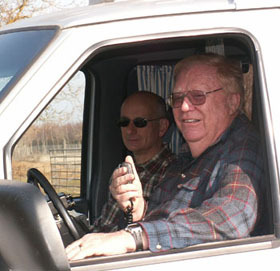 John Desloge, N6MU, points to the south toward Sacramento from CM99, the northernmost point on the January, 2006 route followed by W6XD/R (operating in the Ford van), N6MU/R (in the Subaru Baja) and K6VCR/R (in the Ford F-150 4x4). With John are Rob Hughes, KG6TOA (left) and Hank Feilen (right). Art Goddard, W6XD, made almost 400 random contacts with other stations besides N6MU and K6VCR during the contest and had a total score of nearly 1.2 megapoints. Both N6MU and K6VCR also made several hundred random contacts and topped one megapoint, demonstrating what's possible during a two-day expedition. The group started the contest in Orange County, Calif. at 11 a.m. (PST) Saturday and arrived back about 1 a.m. Monday morning. In this photo Rob (KG6TOA, left), Tom (K6VCR), Hank and John (N6MU) pose during a break in CM99. Art (W6XD) didn't get into the picture because he was still operating in the van. This picture was taken by N6NB Sunday afternoon just before the group headed back south via Concord (CM87) and several grids along the I-5 corridor. 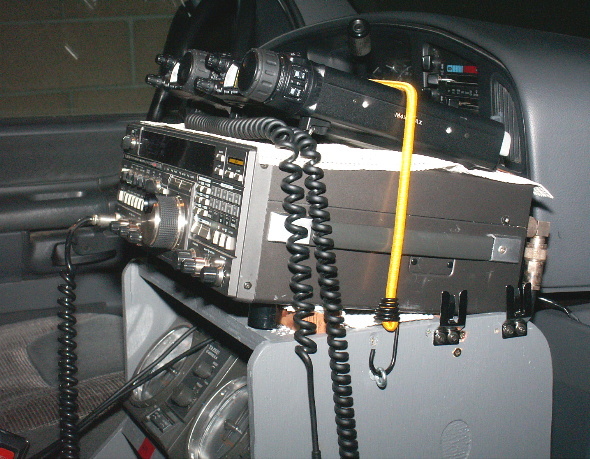 In addition to the original operating console in the rear of the Ford van, a second console between the two front seats was added in January, 2006 so two operators could work simultaneously. Using the two consoles, W6XD and N6NB operate at the Mojave convergence (photo by K6VCR). Art became the field general and quarterback of the roving group as it grew. "Is this pack roving or what?" asks N6MU (in blue shirt) as KE6HPZ (left), N6DN and N6NB gather around N6TEB's Ford Excursion in the Mojave Desert. 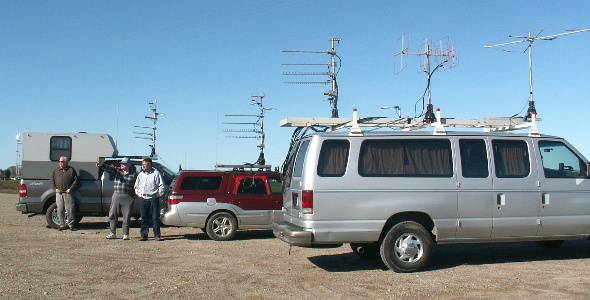 At the time, six 10-band rovers were all at the Mojave convergence (K6VCR/R, N6DN/R, N6MU/R, N6RMJ/R, N6TEB/R and W6XD/R). There was a lot of commotion even on the microwave bands as we all worked each other--and everyone else available. Dave, N6TEB talks with N6DN. Does Dave have enough coaxial cables running into his car? Rob Hughes, KG6TOA (left), who got his call sign specifically to take part in roving expeditions, chats with his sports car rally buddy Hank Feilen. They teamed up with K6VCR and N6MU, respectively. Both Tom and John thought having a "designated driver" with credentials like that was a real luxury. The rover expeditions kept growing in the 2000s. 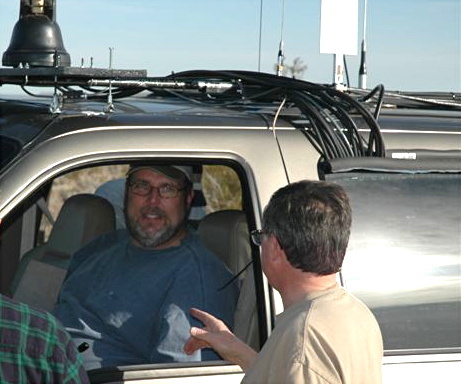 In January, 2007, four stations traveled together from Orange County to Arbuckle, Calif. for VHF SS. The group included K6MI and N6NB in the Ford F150 camper (at left), W6YLZ in the Lexus RX-330, W6TE and WA6LUT in the Subaru Baja, and KG6TOA and KI6AAY in the Ford E350 van, all shown here at the Madera convergence. By then N6NB had added a new flagship station in the F150 that housed kilowatt amplifiers on six and two meters capable of full power while mobile in motion. That station also included amplifiers capable of about 20 watts output on all the microwave bands. The homemade camper attracted a lot of attention, some of it unwanted. It was eventually replaced with a less conspicuous (but also less roomy) commercial truck camper with a heavy roof rack. 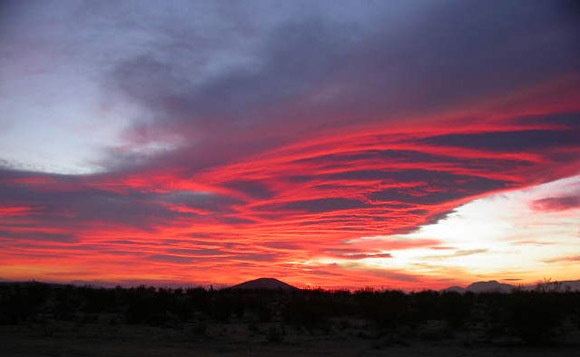 Here's another desert sunset, this one captured at the Mojave convergence on Jan. 20, 2007 by W6YLZ, who managed to run up an impressive score operating alone but also took time to notice and photograph the spectacular scenery. With a rule change imminent, we made an effort to achieve good scores in what turned out to be the last contest under the 1995-2007 rule structure. 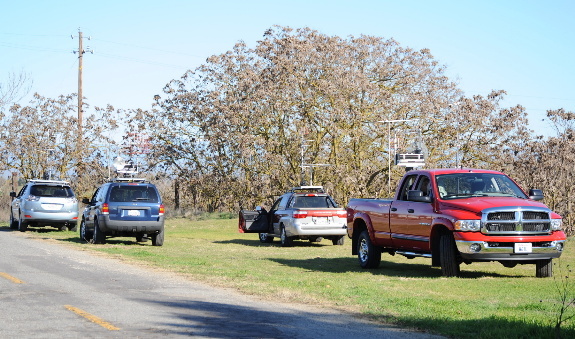 Once again we followed our California route to the Arbuckle convergence northwest of Sacramento with three stations, activating 15 grid squares and posting scores of over 600,000 points for a new record in the September contest. This photo shows the group at the northwestern end of the rove in CM89. The operators included K6MI and W6TE in the Lexus and KK6KK and KG6TOA in the van, with N6MU joining N6NB in the F150. These rover expeditions have continued to grow as the rules evolved. By January, 2009, we had eight complete 10-band stations available--and all eight were on the road. W6TE (with WA6LUT part of the way) and W6YLZ were in the unlimited category in which it's both acceptable and practical to "grid circle." In the classic rover category, grid circling is not a good strategy (with only a limited number of QSOs allowed with any other rover, the savvy way to use those Qs is for multipliers--not to work anyone more than once in a given grid square). We had four rovers in the classic category: AF6O/R, KK6KK/R (with KG6TOA), N6NB/R and W6XD/R (who was the top-scoring rover overall a year earlier in the 2008 VHF SS). This time we also had a talented newcomer in the limited rover category: Carrie Tai, now W6TAI. So who was the eighth rover? Well, N6TEB bought a new Ford diesel truck shortly before the contest and borrowed one of the 10-band "toolbox" stations because he hadn't yet had time to install his own excellent station in his new truck. Dave met us at the Bissell (Mojave) convergence and worked us on 10 bands there, but he did not travel on from there with us. 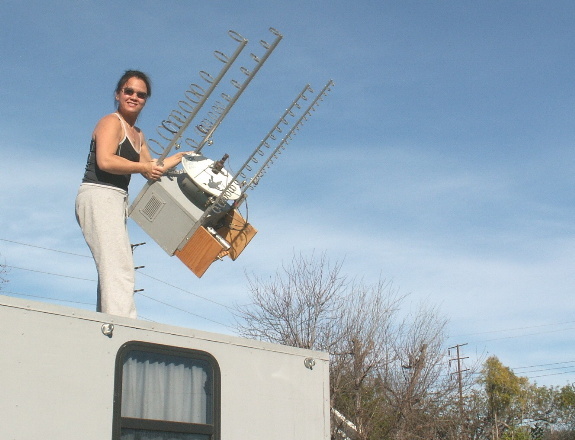 Before the contest, Carrie (W6TAI) hoists an equipment box and antenna system atop a camper. This unit, which includes transverters and amplifiers for four microwave bands as well as antennas for six bands, weighs about 50 pounds, far more than you might suspect from the way she's swinging it around. Here are eight 10-band VHF+ stations in one place. At left are the original two rover stations, stored on red "Radio Flyer" wagons (of course). They live in a storage building and are rolled out for mounting in/on a vehicle. At right there are four "toolbox" stations, each containing transverters (and in some cases, amplifiers) for all bands 902-10368 MHz. Each can be mounted on a roof platform with a rotor or placed in a truck bed for use. Each has a console with VHF+ transceivers, a rotor control and the remote control unit for the toolbox. The console is typically placed on the passenger seat for one-person operations. At right, the van and truck (whose antennas are barely visible) house two more 10-band stations. Altogether, there are 54 transverters and 24 transceivers in the eight stations, with a number of amplifiers ranging in power from a few watts on 10 GHz to full kilowatts on six and two meters. This Ford van is almost identical to the 1995 Ford van it replaces--except that it had 137,000 fewer miles on it and it was 13 years newer. It was the contest home of KK6KK and KG6TOA. Rob deserves an award for driving the old van about 10,000 miles during previous contests. At right is W6XD's Ford Escape, outfitted with a toolbox station for 10 bands. 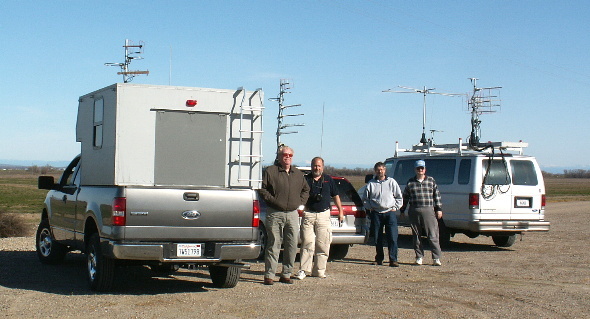 In this photo at the Madera convergence, the stations operated by (from left) W6YLZ, W6XD, AF6O and W6TE are in view. 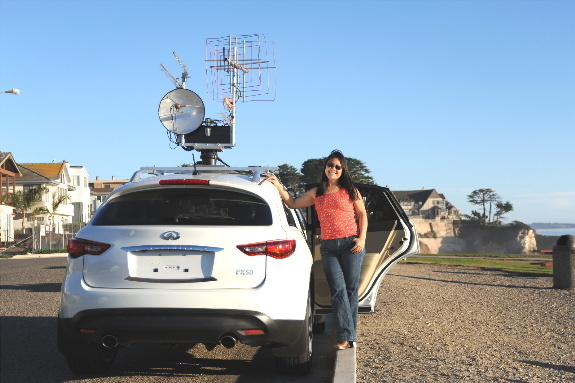 Carrie (W6TAI) poses with her rover setup in Shell Beach (CM95) the day after the contest. She was first licensed as KI6UZV 12 days before the contest and received her vanity call four days after the contest. 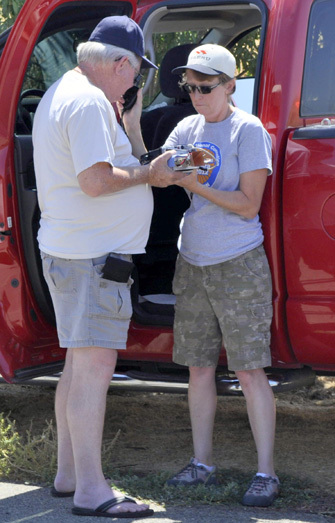 She drove and operated alone but had mentoring from several longtime radio amateurs. None of them had ever seen a newcomer learn more quickly how to operate a contest or aim a microwave dish to find weak signals. She had the #1 score nationally in the limited rover category in January '09, her first contest--and the last contest in which limited rovers could operate on any four bands. Four months later, Carrie earned her extra class license. Later she posted several more top scores as a classic rover, including the #1 score in the country in June, 2010. Carrie holds a graduate degree in urban planning and works in that field when not pursuing amateur radio and a host of other avocations. 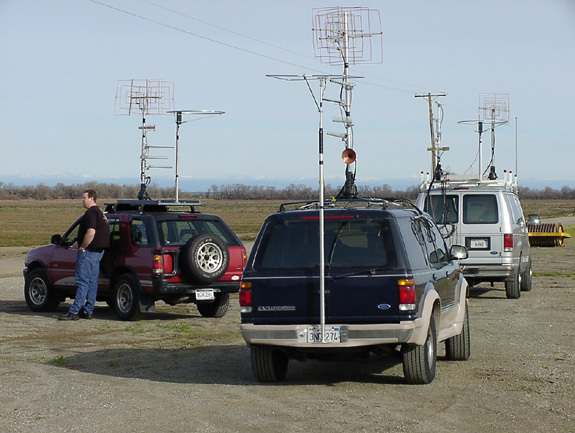 By Summer, 2009, we had enough hardware to outfit eleven (yes, 11) vehicles as 10-band rover stations, and four other members of our group (KE6HPZ, N6TEB, N6VI and W6TE) had built their own 10-band rovers. Several of us who have been longtime members of the Southern California Contest Club decided to enter the newly announced club competition in the August UHF Contest. We also submitted a club entry under the SCCC banner in several more contests. The SCCC group had the highest club aggregate scores in the country in August and September, 2009, and in January, June, August and September, 2010, and January, 2011. No west coast club had ever had the top overall score in the club competition in any VHF contest until the SCCC won these seven club gavels. In addition to hardware, the SCCC has been blessed with talented operators and leaders. Art Goddard, W6XD, has become the group's field commander, functioning as a combination quarterback and cat-herder. Marty Woll, N6VI, has brought an accountant's expertise to the planning process, generating spreadsheets and documentation that have been a key contributor to SCCC's success. To compete as a club, the SCCC rovers had to devise new routes that kept us entirely within the official boundaries of the club, as required by the rules of the club competition. Each participating club must designate a center point. Only members who live within 175 miles of that point can compete for the club, and rovers may not count any score achieved while operating outside this 175-mile radius. There are elaborate rules governing participation by non-members along with members. In general, a rover score may be counted by a club if there are two operators and one is a resident club member. 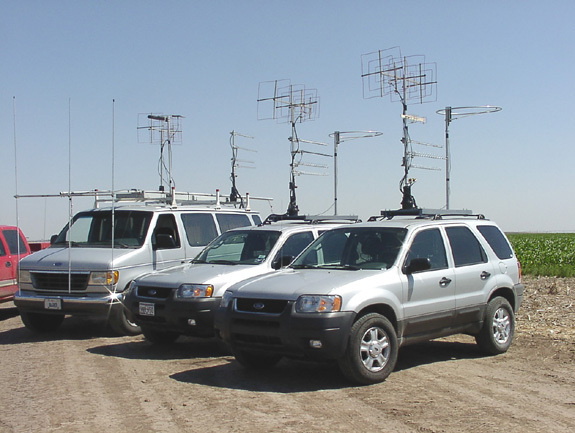 Here are eight rover stations lined up during the August, 2009 UHF Contest for a photo opportunity near Palmdale, Calif. (from left): W6YLZ, N6MU, AF6O, W6TAI, W6XD, N6NB, KK6KK (with KG6TOA) and W6TE (with K6MI). In addition, several other stations joined in the SCCC club effort, including some at home and others on DXpeditions to rare grid squares. 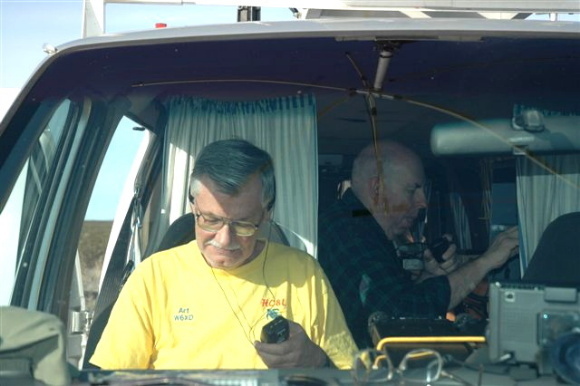 To many SCCC members, the idea of a DXpedition to San Diego (DM12) seemed preposterous, but K6VCR's expeditions yielded 10 new multipliers for all of us, only two or three of which we might have otherwise worked. 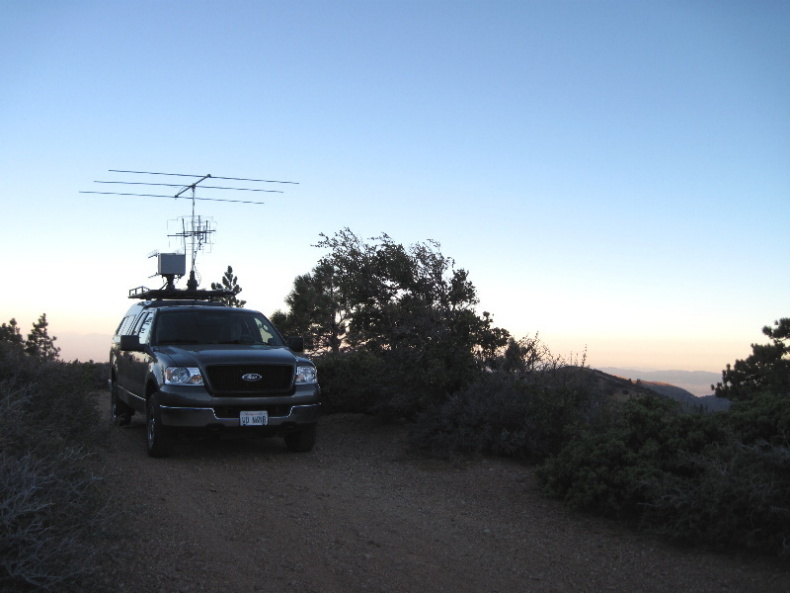 N6TEB's expeditions to Gaviota State Beach (CM94, west of Santa Barbara), produced many more new multipliers and gave him a chance to give in-the-field contest experience to a young ham couple: K6SVG and KI6PXI. Seven rover stations line up for another photo opportunity, this time in Joshua Tree National Park, with the bizarre shapes of the trees competing with toolbox stations for visual drama. 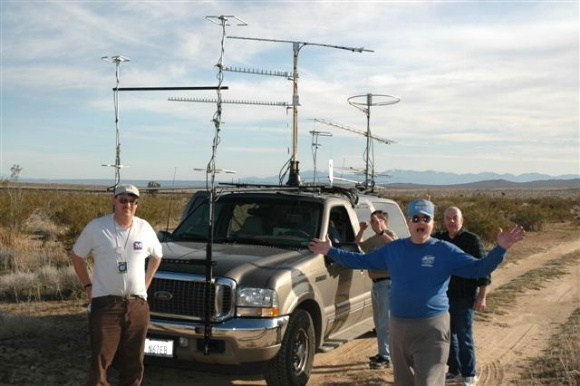 These seven were among nine rovers who traveled together for at least part of the September, 2009 VHF Contest. This photo was taken in the rare grid of DM23 just before the end of the contest. N6VI's 4Runner is in the foreground at right. 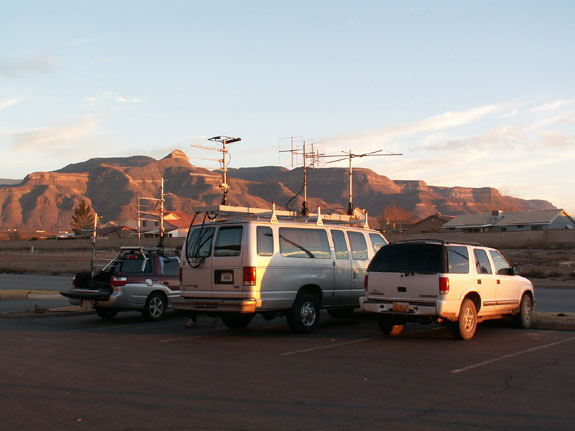 This photo was taken at the end of the August, 2009 UHF contest in Pahrump, NV (DM26). From left: W6TE, N6NB, KG6TOA, W6TAI, N6MU, W6YLZ, AF6O, KK6KK, W6XD and K6MI. 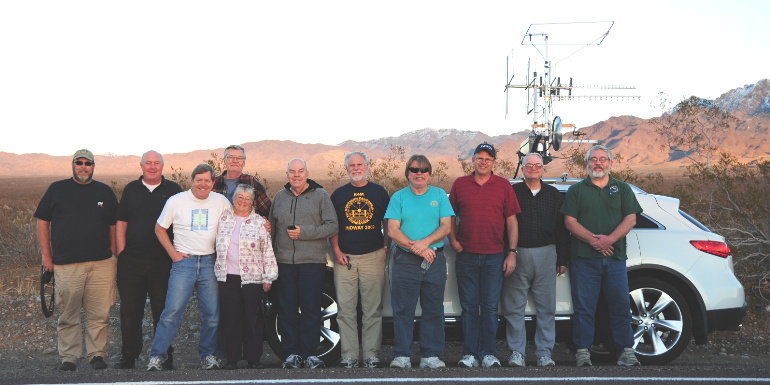 In the January, 2010 VHF SS, this group gathered in the California desert near the end of the contest. They are (from left): N6TEB, AF6O, N6VI and KJ6CNO, W6XD (beyond Marty and Clara), N6NB, N6HC, KK6KK, K6WCI, N6MU and K9JK. Not shown is W6TAI, who took the picture. JK flew out from Illinois the join in the group rove. 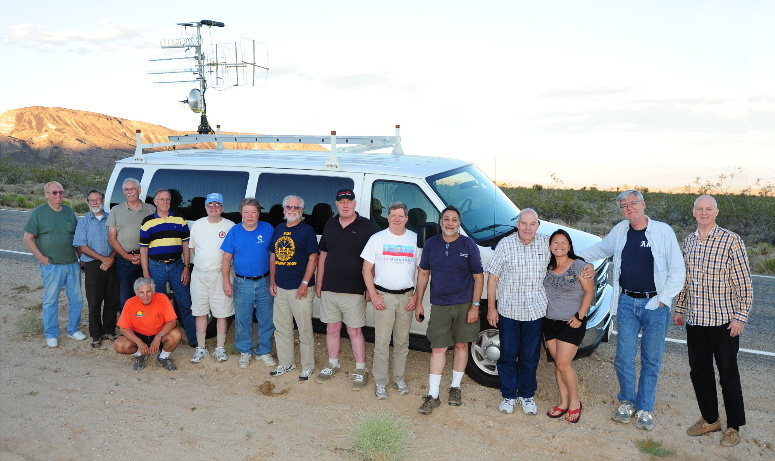 This group of 15 operators in 10 rover vehicles gathered in the eastern Mojave Desert at the end of the June, 2010 VHF Contest. They are (from left): KG6TOA, K6MI, W6TE, W6KYO (kneeling), NI6E, N6MU, KK6KK, N6HC, AF6O, N6VI, W6YLZ, N6NB, W6TAI, W6XD and K6ZMW. One of the highlights of this contest was that Carrie (W6TAI) had the highest rover score in the country. That is surely a first for a YL driving and operating alone as opposed to operating as part of a two-person team. During this contest N6TEB's multioperator group operated at the N6NB cabin at 6,800' elevation in the Tehachapi Mountains and posted the highest west coast multioperator score in many years. Their 11-band station (including 24 GHz) had a big signal everywhere we went. WB2WIK guest-operated the new 10-band N6NB home station in the flatlands of DM13 and had the highest single operator low power score on the west coast. A noteworthy thing about the August, 2010 UHF Contest was WB2WIK's national first place score in the single operator low power category. Steve guest-operated N6NB's home station in DM13. The 70-foot tower, with antennas for all bands from 14 MHz to 10 GHz, is shown above. 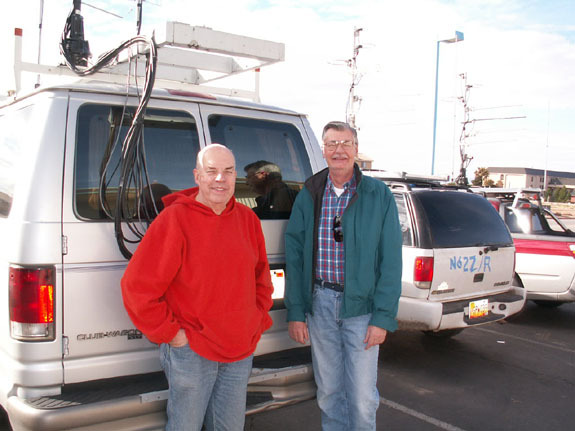 It was the first time since the late 1970s that any west coast fixed station had been #1 nationally in the UHF contest. (N6NB, operating fixed atop Mt. Pinos, won the first two UHF contests in 1978 and 1979). August 2010 was also a very successful contest for the SCCC rovers. N6NB and W6TAI both broke the rover scoring record and W6YLZ finished #1 nationally in the limited rover category. 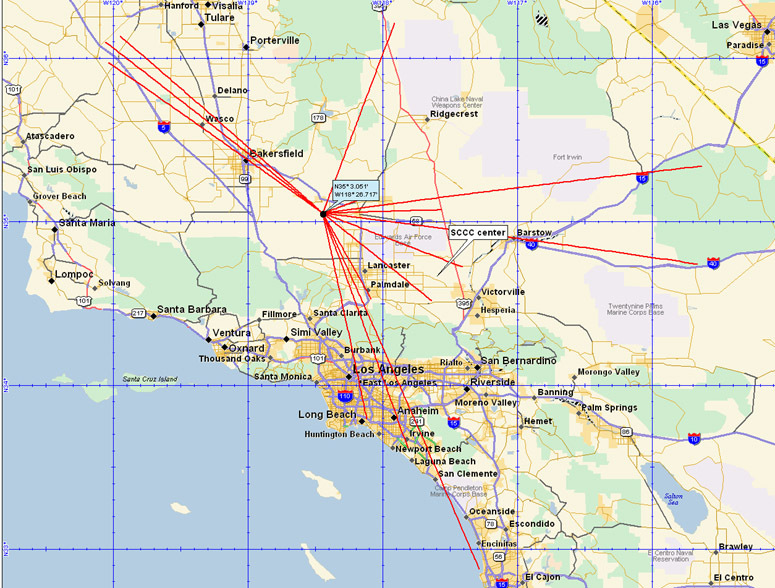 This map shows some relevant locations for the Southern California Contest Club rovers during the September, 2010 VHF contest. The club center is marked by a tag near the middle of this image. 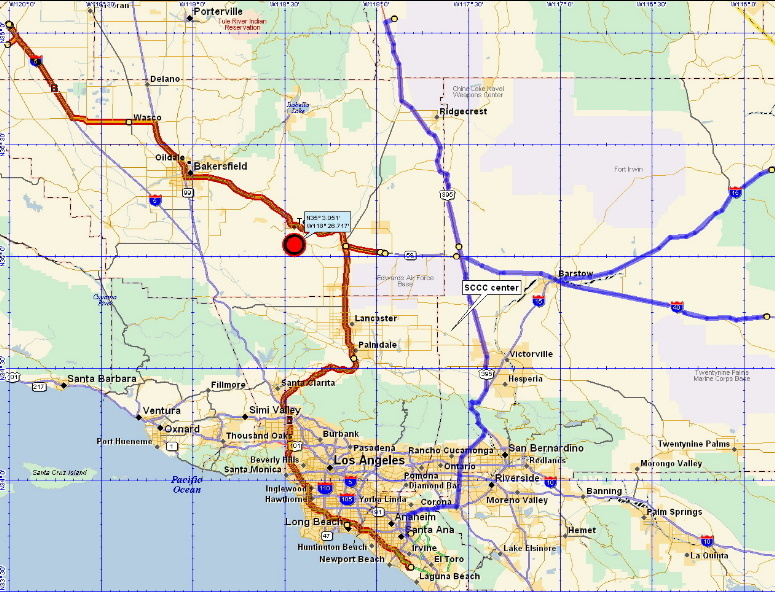 The main group of eight rovers followed the route in orange and red, starting at Signal Peak in Orange County (DM13) and ending near Kettleman City (CM96) after activating nine grids. The route of W6TAI, who roved alone, is shown in blue. Carrie went on a 10-band DXpedition to three very rare grid squares: DM16, DM25 and DM24. Meanwhile, N6NB operated fixed in the single operator (QRP) portable category at 6,800' elevation on a road near the Tehachapi cabin (marked by a red dot). By working the rover group on 10 bands in nine grid squares and by working W6TAI for 18 more multipliers in three other grid squares, N6NB was able to set a new September scoring record of about 266K in the QRP category, breaking a record of 171K set by K9PW 13 years earlier. The top rover score in the country in this contest was posted by Bob Mann, KK6KK. This station setup was used by N6NB in the single operator (QRP) portable category in September, 2010. Because the antennas had to be installed on site to avoid damage from low trees along the 10-mile dirt road up the mountaintop, it made sense to use slightly larger antennas than in a typical rover installation where the truck is driven with the antennas in place. If you look beyond the mountain, you can see an inversion layer forming. It resulted in good tropo conditions up the San Joaquin Valley late in the contest, allowing N6NB to work some distant multipliers with 10 watts that had been unworkable earlier in the weekend. 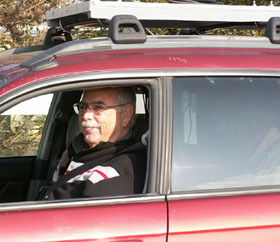 The January, 2011, VHF Sweepstakes was the first rove for several newcomers to the SCCC group. This photo shows K6AH and his wife Sally (both newcomers), W6YLZ (a veteran of many roves), N6UWW (on her second rove), KG6OKB (on his first rove), and N6HD (right) with his friend Evelyn (on their second rove). The photo was taken by WB6BFG (on his third rove). Others roving with the group at least part of the weekend were longtime rovers K9JK (+N6MU), KE6HPZ, N6HC, and N6TEB (+K6WCI). Of this group, only three rovers were together all weekend. WB6BFG and N6UWW began the contest in Del Mar Heights and quickly handed out the DM12 multiplier on 10 bands before joining the group. This time most of the group gathered at Signal Peak (DM13) at the start of the contest to work a contingent from the San Diego Microwave Group who were atop Mt. Soledad (DM12). 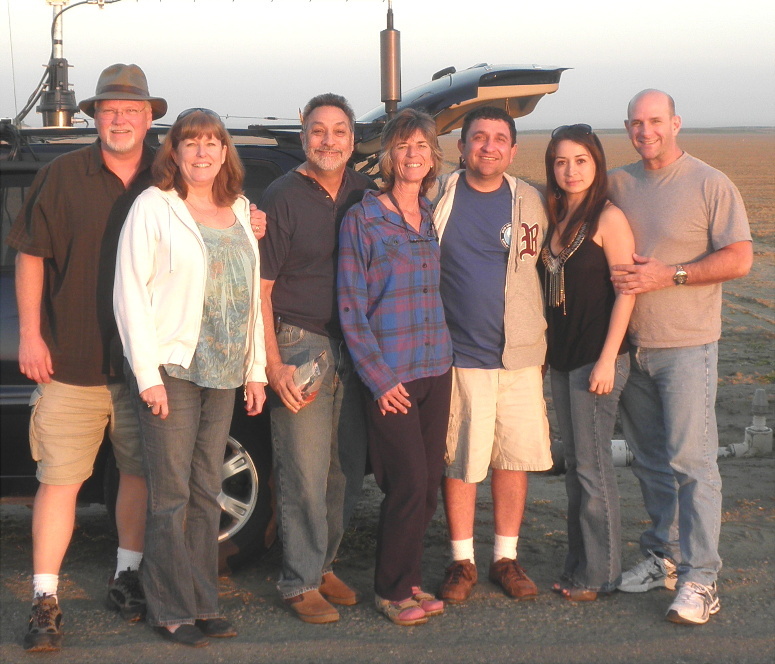 The San Diego group included KB5MU, KD0IF, N6IZW, W5NYV and W6OYJ. Thanks to them for so many microwave Qs! When the results were compiled and published in QST, K9JK and N6MU had the top rover score in the country, followed closely by K6AH. KE6HPZ won the unlimited rover category and W6YLZ was again #1 in the limited rover category. N6NB broke the January single op portable scoring record. A highlight of January, 2011 was a DXpedition to CM94 by W6TAI/R, who provided 10 rare band-multipliers to the rovers as well as N6NB (in the single operator portable category). This photo shows the 152-mile path from Signal Peak in DM13 to Carrie's site on a bluff near Gaviota State Beach. As the Hepburn forecast had predicted, there was just enough over-water tropo to make this possible. In June, 2011, the SCCC rovers visited 10 grid squares within club territory, with K6MI the national winner of the rover category, just ahead of K6AH. A highlight was the debut of Art Goddard's daughter Amy, W6XDX, as a full weekend rover in a father-daughter team. K6GEP joined the group for part of the weekend, as did N6HC and N6NC. Meanwhile, W6TAI went on a solo rove to 10 grid squares on her own, covering 873 miles and providing many multipliers to the rover team and others, including the N6VI multioperator group on Frazier Mountain and N6NB, again in the single operator QRP portable category. The map immediately below shows the microwave paths over which N6NB worked the rover group or W6TAI in an effort that led to a third national record score in the QRP portable category, this time with a score of 295K. This photo, taken just before the start of the January, 2012, VHF Sweepstakes, shows eight rovers near Port Arthur, TX in EL39. This group included 10 members of the Nacogdoches (TX) Amateur Radio Club and five visitors. For some years we have been watching the VHF contest successes of the Nacogdoches Amateur Radio Club. Despite being in a town of only 33,000 people nowhere near any big city, this club has been turning in impressive scores year after year. After talking with Army Curtis, AE5P, and Marshall Williams, K5QE, at the 2011 Central States VHF Conference in Dallas, several of us accepted their invitation to join them for a VHF contest in East Texas. Six Californians traveled there. Five of us roved with Nacogdoches club members, using their call signs and helping out wherever we could. The sixth visitor (W6XD) joined the team at K5QE's well-equipped multioperator station. We were amazed by what we saw. This small club had more than 20 members active in VHF SS, including about 15 who roved and five who operated at K5QE. Several others got on at home. We met some wonderfully dedicated and conscientious people during our week in Nacogdoches. We hope to stay in touch with them for the rest of our days in amateur radio. We are very grateful for their hospitality. It was a banner year for the Nacogdoches club, the rovers and K5QE. The club, moving up from the local club category to "Division I-A," had the highest club aggregate score in the country. Nacogdoches had the top seven rover scores, and K5QE had the highest multioperator score anywhere. Even the weather was perfect--with temperatures in the 70s, no rain, and evenings warm enough for outdoor station-building. It was a memorable experience. 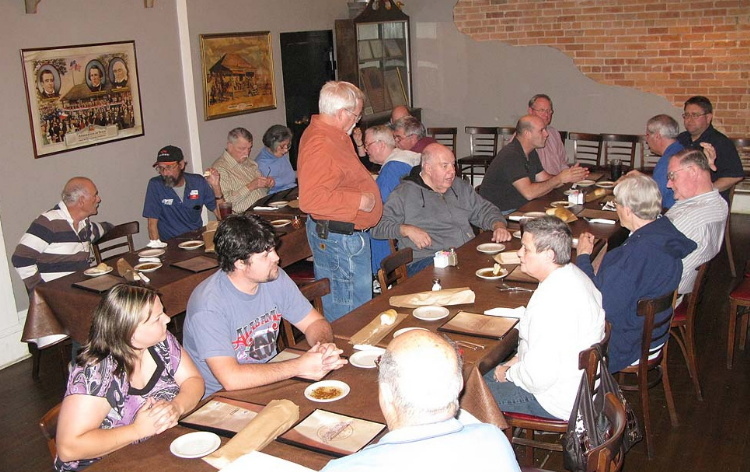 This group, which included almost the entire K5QE multioperator team and many of the Nacogdoches rovers, gathered for dinner on the Friday night before the January, 2012, VHF Contest. It was a chance to meet and greet--and a time to plan for what turned out to be a very successful contest for K5QE, the Nacogdoches club and the rovers. After the 2012 East Texas adventure, the Southern California Contest Club sent smaller roving groups afield for the June and August, 2012 VHF/UHF Contests. In June, the club's rovers had the top six rover scores nationally, led by the two-person team of W6XD/R and AE6Z with 272,500 points. Close behind were KI6FGV/R, K6AH/R, N6HD/R, the team of WA6WTF/R and W6TE, and K9AOG/R. N6NB led the single operator portable category nationally with 136,840 points. In the very competitive multioperator category, N6VI was fifth nationally with 509,922 points. In the August UHF Contest, only four SCCC rovers ventured out, but they finished 1-2-3-4 in the country. N6NB/R won, with W6XD/R a close second, W6TAI/R third and N6EY/R (paired with W6TE) fourth. At the last minute, N6MU agreed to get on for a few hours at N6NB's home station--and he had the top single operator, low power score on the west coast, while the club won another gavel. In January, 2013, N6NB and W6TAI joined a small group of rovers in East Texas. Perhaps the highlight was the first use in a contest of the tower trailer built from a kit (described elsewhere on this website). 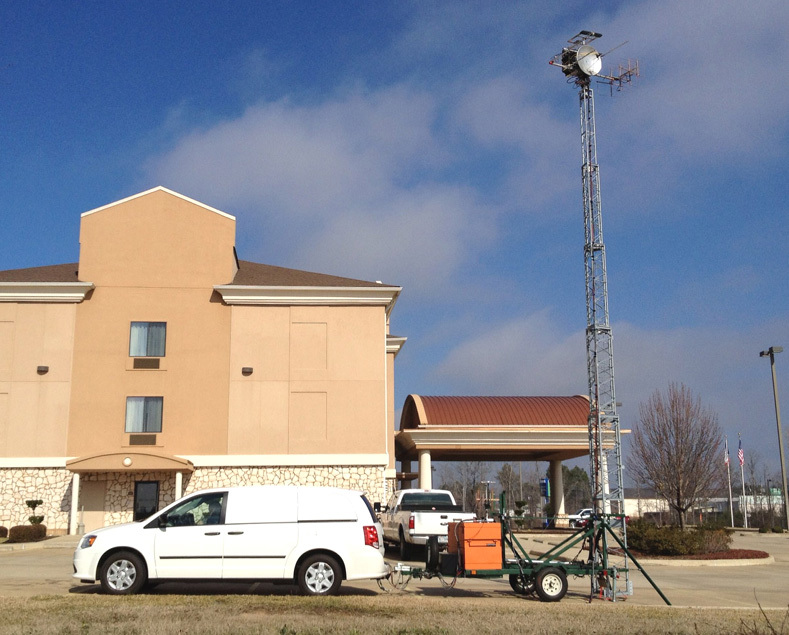 The photo below shows the tower raised about halfway beside a hotel in the town of Center, TX (EM21). 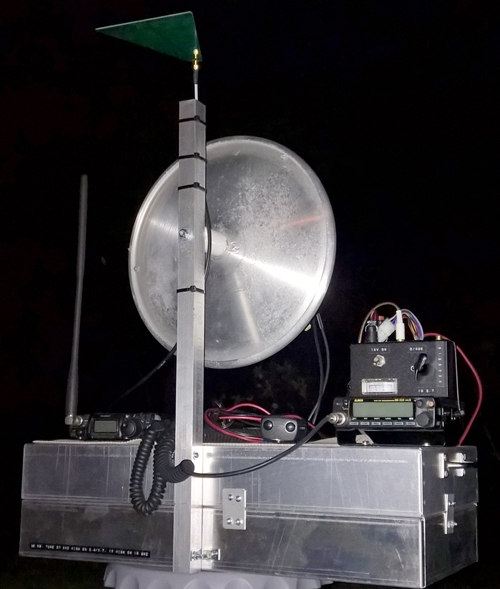 The tower trailer proved its worth by making it possible to work K5QE on all bands through 10 GHz in six grid squares, even in places where other rovers could not get through because of trees and buildings in the near field. The tower trailer was set up 10 times over two days in a rove that began near Port Arthur, TX and ended in northern Louisiana. N6NB and W6TAI finished first and second nationally in the rover category. This is N6NB's new rover van and tower trailer, shown with the tower extended about halfway. This setup was built in California during 2012 and driven as far as Cape Cod, MA before being returned to Texas for the January contest. In a way, this was reminiscent of the late 1970s, when N6NB towed a tower trailer from California to Vermont for VHF contests. Of course, that tower trailer was only set up once for each contest because there was no rover category then. N6NB was competing in the single operator category in the 1970s. 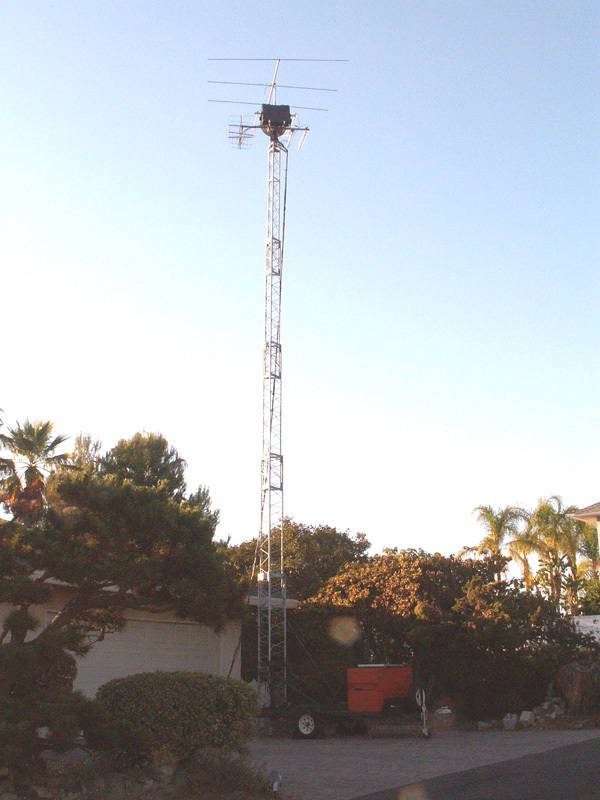 The photo below shows the new tower trailer back home in Southern California for a single operator QRP portable effort in the June, 2013 VHF Contest. The photo was taken just as the fog burned off at Signal Peak, a hilltop in Newport Beach, CA. The June, 2013 VHF Contest was a good one for the Southern California Contest Club, which won another club gavel--but just barely. SCCC had a club aggregate score of 1.36 million points. The Potomac Valley Radio Club had 1.33 million points. In the individual results, four SCCC members placed in the top five in the rover category. K6AH was first, KI6FGV (now K6FGV) was second, N6HD was third and KJ5MSY was #5 overall. In the very competitive multi-multi category, N6VI was #3 nationally. It was the first time in many years that a west coast multioperator station had fared that well nationally. W6TE was #1 nationally in the unlimited rover category, and N6NB won the single operator (QRP) portable category. 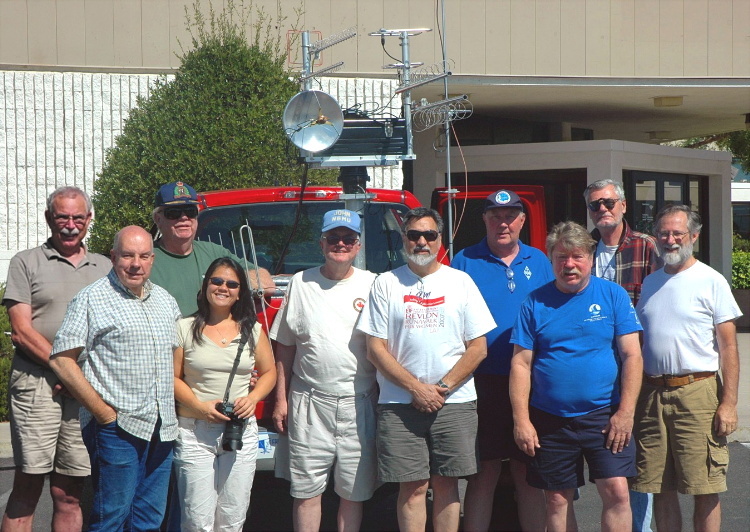 A small group of SCCC members operated the August, 2013 UHF Contest as rovers (see the photos below), and they won another club gavel. N6NB finished first in the rover category, followed by KI6FGV and the family duo of N6EY and N6KYS. Sharing a station under the family rule for the first time (they were married three weeks before the contest), Jason and Kris tied for third nationally. W6TTF and WA6WTF tied for sixth. 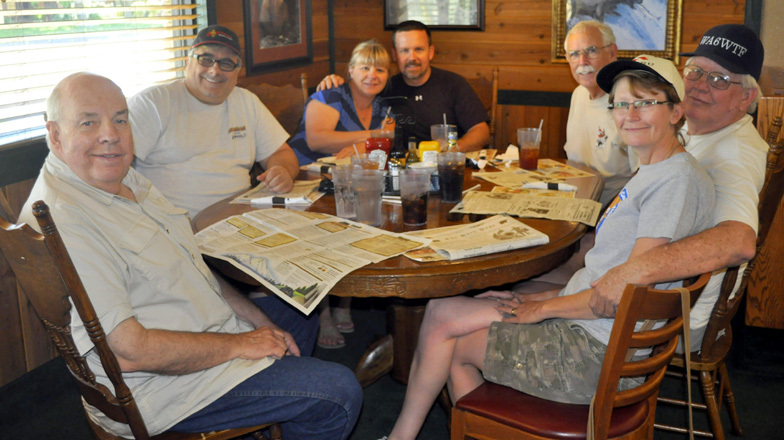 This group of rovers gathered for lunch during the 2013 UHF Contest. They are (from left): Wayne, N6NB; Jim, KI6FGV; Kris, N6KYS; Jason, N6EY; Dave, W6TE; Carole, W6TTF; and Jan, WA6WTF. The group included two couples: Kris and Jason Boyer (who had been married for all of three weeks when they roved together) and Carole and Jan Whitteberry (who had been married a little longer). 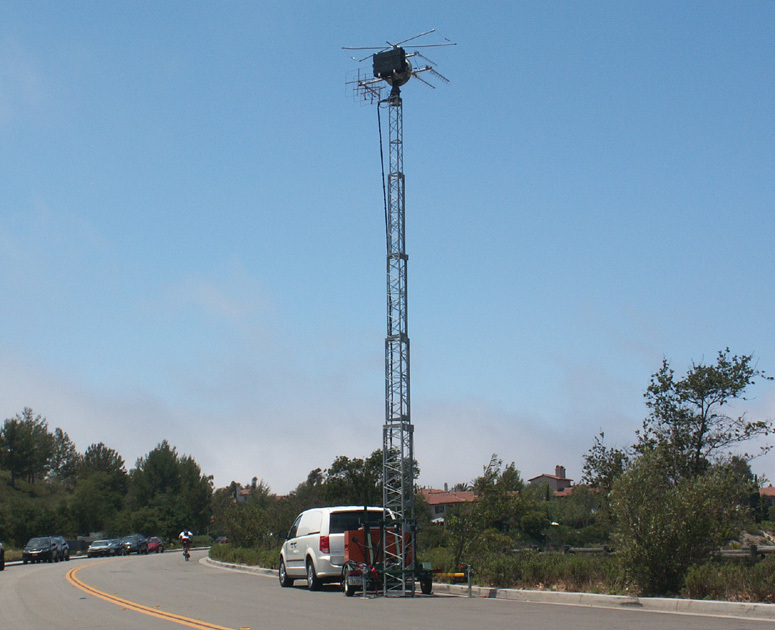 Certainly a highlight of the August, 2013 UHF Contest for the Southern California Contest Club was the extensive use of 24 GHz--by women, as the photos below illustrate. Jan and Carole Whitteberry (WA6WTF and W6TTF) are the picture of concentration as they make a contact on 24 GHz, while newlyweds Kris and Jason Boyer (N6KYS and N6EY) observe the customs of chivalry--Jason holds the 24 GHz transceiver while Kris makes a contact! Thanks to W6TE for these photos. 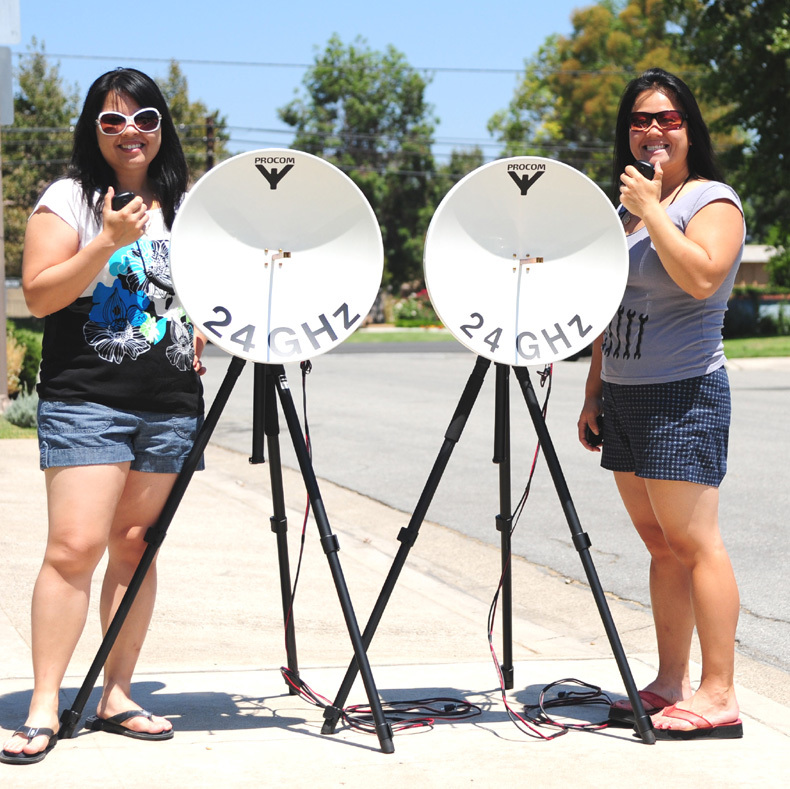 Here's Marie Tai (W1TAI, left, visiting from Boston, MA) with her sister Carrie (W6TAI), posing with the high-performance 24 GHz systems that they used during the 2013 UHF Contest. ...And this is what happens when the Tai sisters make contacts on 24 GHz. 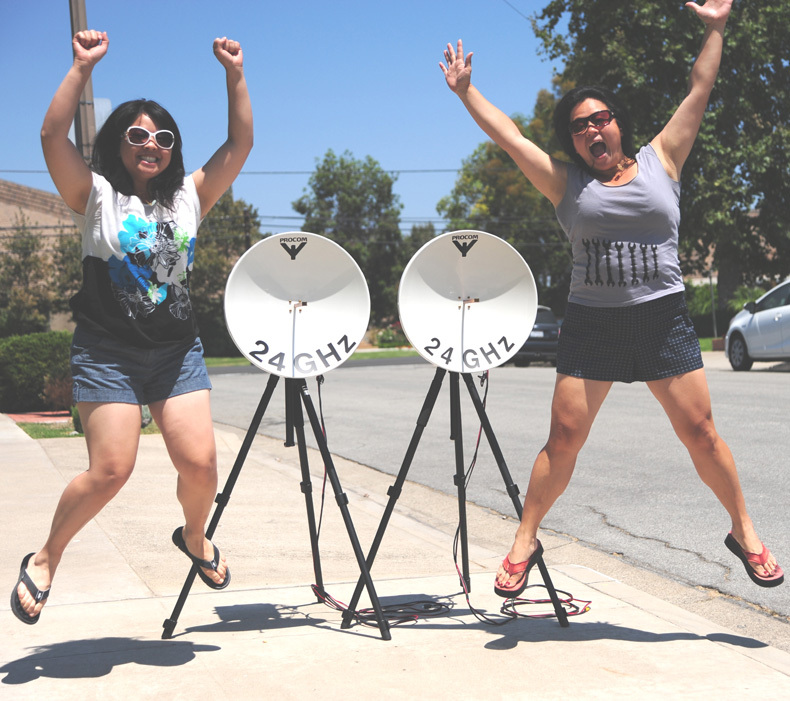 Um, well, the truth is that this photo was staged after the contest, but anyone can see their unbridled enthusiasm for 24 GHz! During the September, 2013 VHF Contest, seven rovers were in the field for the Southern California Contest Club--AF6O, K6AH, K6FGV, KJ6CNO, N6HD, N6VI and W6TAI. K6FGV was #1 nationallly, with K6AH a close second, reversing their order of finish the previous June. N6VI was third and N6HD fourth, with AF6O seventh. Carrie, W6TAI, went to Gaviota, about 30 miles west of Santa Barbara in the rare grid square of CM94. 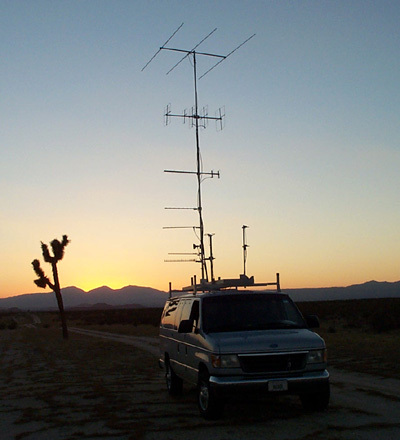 She worked the other rovers on all bands through 10 GHz over a 150-mile path down the California Coastline in DM13. Meanwhile, W6TE and K6MI were a two-person multioperator group on Frazier Mountain (DM04), setting a new Southwestern Division record and finishing #5 nationally in the highly competitive multi-multi category. I (N6NB) won the single operator (QRP) portable category, also setting a new Southwestern Division record. I set up in the driveway of a vacant house in Panorama Heights, east of the town of Orange, CA. There was no permanent amateur radio station there, thus qualifying the site for the SO portable category. I used a small Honda generator beside the house both days and ran on the batteries in my minivan at night, complying with the portable power requirement. Remarkably, the neighbors didn't complain about the generator or the tower trailer in the driveway, and both were gone by the Monday after the contest. But the neighbors may see more antennas later (I now own that house). The photo below shows the tower trailer in the driveway at Panorama Heights. 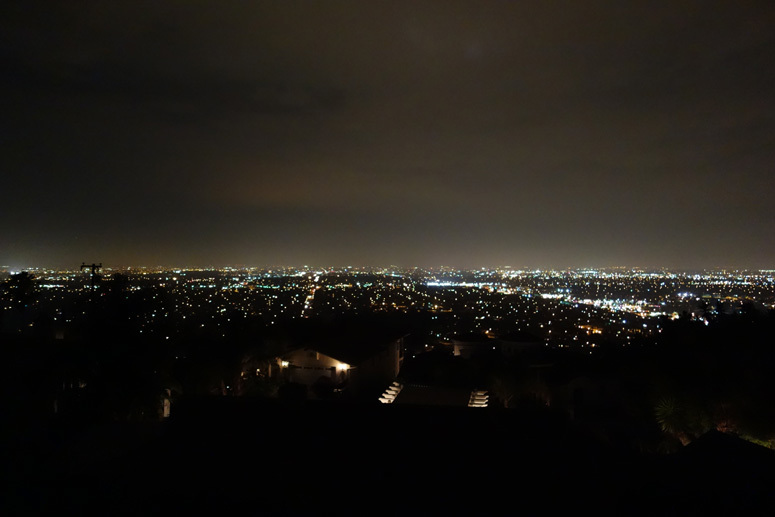 This is the view from the Panorama Heights house, looking northwest toward Los Angeles. 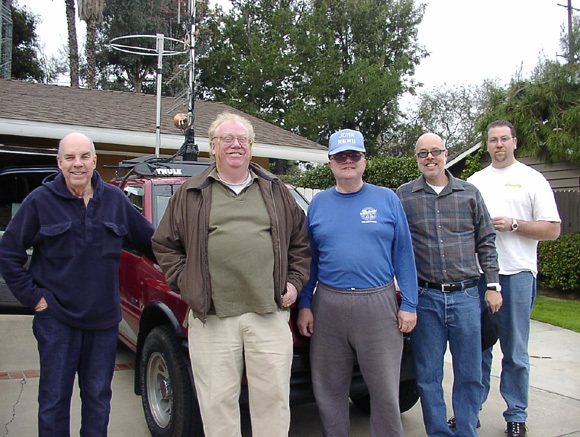 In 2014, the Southern California Contest Club fielded small roving groups for the January VHF Contest and the August UHF Contest--and won two more club gavels. In January, N6TEB (operating with K6WCI) had the highest rover score nationally. K9JK (operating with local SCCC member N6HB) was second. A well-known eastern rover team was third, while W6TE was fourth. W6TTF and WA6WTF tied for fifth nationally. Other SCCC winners were W6YLZ, who was #1 nationally in the limited rover category, K6MI, #1 nationally in the single operator three band category, and N6NB, who had the #1 single operator portable score in the country. For all three, it was a good illustration of the value of having a group of rovers within range. For example, N6NB, operating in a van with a tower trailer in flat terrain near Madera, had 123,000 points, while the runner-up in the single operator portable category had 8,000 points. In August, 2014, there were only four SCCC rovers, but they were the top four finishers nationally. N6NB was first, followed by W6TE, W6TTF and WA6WTF. W6TAI and her sister Marie, W1TAI (visiting from Boston), tied for second nationally in the single operator low power category while sharing the Panorama Heights fixed station. As in 2013, they operated on all bands through 24 GHz, using one of the 24 GHz systems shown in the 2013 photos. The January, 2015 VHF Contest saw the Southern California Contest Club win another club gavel. In the individual competition, K6FGV edged out N6VI for #1 in the rover category by a narrow margin, while N6HB (with K9JK) finished third. W6TTF, WA6WTF and W6TE were #4, #5 and #6 nationally. N6NB, operating near Madera again with the same hardware as in 2014, had the #1 single operator portable score, setting a new national record with almost 180k. 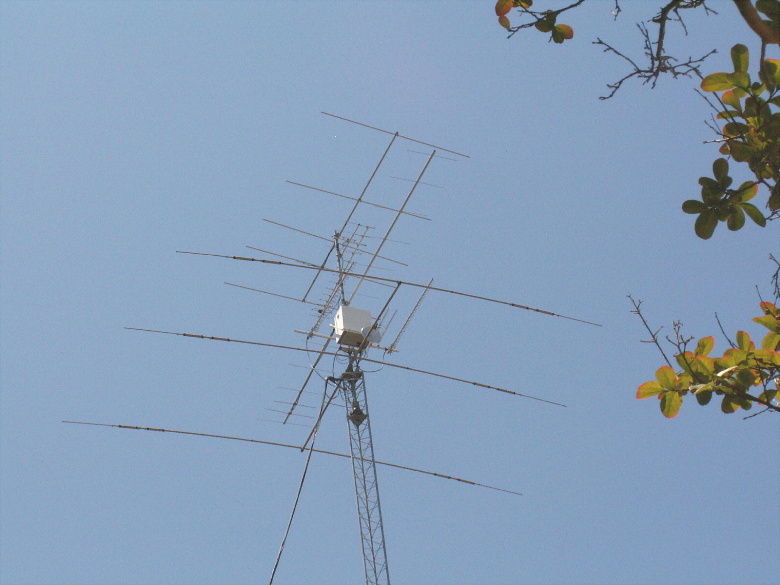 The September, 2015 VHF Contest seemed like two separate contests for N6NB. On Saturday I joined W6IT and W6TAI to rove through five Southern California grid squares, starting in DM12 (near Solana Beach), then roving through DM13 and DM03 before ending up in Monrovia for DM04 and DM14. W6IT was using the white Ford van shown in various photos on this web page while W6TAI was using her Infinity rover, also shown in several photos. In all five grids, we worked on 11 bands (50 MHz to 24 GHz). Greg and Carrie were only available on Saturday, so they drove home while I headed over the mountains to the San Joaquin Valley late Saturday night. Sunday morning I met K6MI, N6MTS (with WA6OIB) and W6TE in Kettleman City. Some of them were only available to rove on Sunday, so this plan worked well. I had brought along two extra very compact 10-band rover stations that I lent to N6MTS and K6MI. W6TE has his own excellent 10-band rover station (11, counting his new DB6NT system for 24 GHz). It didn't take long to set up and check out the extra stations. We started in DM05 and quickly worked each other, then worked multioperator station W6TV, operating fixed on a mountaintop east of Fresno, about 100 miles away. We were amazed to see how easily the guys with the compact stations could work W6TV all the way to 10 GHz. I worked W6TV on 24 GHz as well. Then we moved to a nearby hilltop in grid CM95 and did everything again. W6TV was again able to work everyone through 10 GHz and work me on 24 GHz. Next we moved to a site near the California Aqueduct at the boundary of DM06 and CM96--in totally flat terrain. Once again, W6TV was loud and clear on all bands, including 24 GHz. Finally, we made the 85-mile drive north to Madera to activate CM97 and DM07. Our site in CM97 was next to an orchard--not good for microwave work. We did manage to work W6TV on all bands but 5.7 GHz and 24 GHZ, then moved on to DM07 (with no orchard) and easily worked W6TV on all bands, including 24 GHz. When the contest ended, we had all worked each other and W6TV from six grid squares. I had worked W6TV from five grid squares on 24 GHz, making Pat and Rob (W6TV operators) eligible for VUCC on 24 GHz. Counting the separate rove with W6IT and W6TAI on Saturday, I had activated 11 grid squares and logged 132 total multipliers. I've never before done a rove in quite this way (with a completely different group of rovers each day). but it worked. I had the #1 rover score nationally, while W6TE was #3, K6MI was #4 and N6MTS was #5. W6IT and W6TAI were #7 and #8, respectively. In 2016 there was another passage in VHF-UHF amateur radio: the end of the ARRL-sponsored UHF Contest and the creation of the new 222 and Up Distance Contest. It saw N6NB post the highest score in the last UHF Contest and the highest rover score in the first 222 and Up contest a year later--then follow up with a #1 finish in the rover category in the 2017 September VHF Contest. After a turbulent year in which the August UHF Contest was canceled by ARRL, the 39th annual August UHF Contest was rescued by a nationwide coalition of UHF-oriented clubs and concerned individuals. ARRL had announced in March of 2016 that the UHF Contest was being removed from the contest calendar. The leaders of the Mt. Airy VHF Radio Club, the Northern Lights Radio Society and the Pacific Northwest VHF Society joined many individuals coast to coast to take over sponsorship of the contest and hold it on its traditional date, the first weekend in August. John Kalenowsky, K9JK, agreed to act as contest manager, taking over the administrative details that had been handled by paid ARRL staff members as well as volunteers. The independently sponsored contest attracted more logs than any of the last four ARRL-sponsored UHF contests. The full results appear elsewhere on this website. The 2016 winners' list included many familiar calls. K1RZ had the top single operator high power score with 171,216 points while K2DRH had the #1 single operator low power score with 89,991 points. N6NB posted the top rover score and top overall score with 278,418 points. The K2LIM team won the multioperator category with 77,283 points. The Southern California Contest Club won the gavel for the highest club score. Shortly before the independent UHF Contest was held, ARRL announced that it would launch a new 222 and Up Distance Contest on the first weekend of August in 2017. The sponsors of the UHF Contest decided not to continue it beyond 2016 in view of ARRL's announcement. Although the new 222 and Up Contest includes the same bands as the UHF Contest, the rules are different in several ways: 1) it has no grid square multipliers; 2) scores are based on distances worked in kilometers times widely varying band multipliers (2x for 222, 1x for 432, 4x for 902, 2x for 1296, 6x for 2.3 GHz, 10x for 3.4 GHz and 5.7 GHz, 6x for 10 GHz, and 20x for all higher bands); 3) EME contacts are not allowed; and 4) there are no national awards but up to 90 first place awards are given in five categories in 18 newly defined geographic regions. A group of us decided that the new 222 and Up Contest was a good occasion to do something new: operate in Colorado, more than 1,000 miles from our homes in California. So W6TE, K6MI and N6NB drove to Colorado in separate vehicles outfitted with gear for all bands through 10 or 24 GHz plus extra equipment for five more people who flew in. Our team--we called ourselves "Californians and Friends Visiting Colorado"--included these people (in alphabetical order): K6MI, N6EY, N6KLO, N6KYS, N6NB, W6JMK, W6TE, and WB6ITM. It turned out to be a very talented group ranging from people who have been licensed for 60 years to someone licensed five years (16-year-old Kaylie Boyer, N6KLO--who proved herself to be a diligent station builder as well as a great operator). Although these were good results, they could have been better. A broken SMA right-angle connector took N6NB's 3.4 GHz station off the air, forfeiting about 37,000 points for N6NB and costing each of the other stations in the group about 6,000 points. It was fascinating to operate on the microwave bands in Colorado for the first time. We saw things we don't often see in California, like rain scatter so bad that 10 GHz signals sounded like aurora-reflected signals. We also saw violent tornado-like conditions with ferocious rain and fierce winds in August--a rarity at home. The photo above shows N6NB's van and tower trailer in grid square DM89aa about 15 miles from Limon, Colorado. In the background a storm is approaching. The storm swept across the plains with very high winds and heavy rain just after the tower was lowered. After driving about 3,000 miles to operate the 222 and Up Contest, K6MI, W6TE and N6NB decided to rove in the September, 2017 VHF Contest, joined by N6MTS. 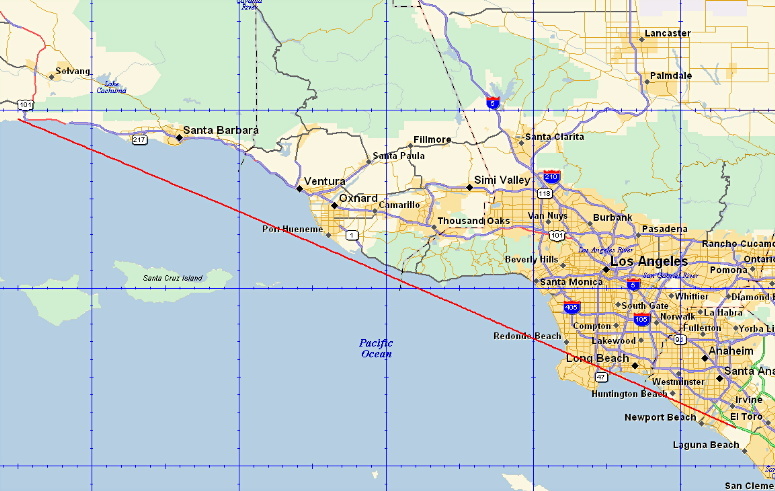 N6NB worked W6TAI/R in the four L.A. Basin grid squares on 11 bands (50 MHz through 24 GHz) and worked W6IT from the four L.A. grid squares on most of the bands through 10 GHz, then headed north. I had agreed to meet K6MI, W6TE and N6MTS at the Kettleman City grid convergence. On Saturday evening we worked in DM05, CM95, DM06 and CM96 on all bands through 24 GHz. On Sunday we went further north to work DM07 and CM97. A real highlight was again having W6TV, a well-equipped multioperator station on Bear Mountain, to work on all bands through 24 GHz in the six grid squares we activated Saturday night and Sunday. I worked W6TV on 24 GHz from six different grid squares, as did K6MI/R. That means W6TV qualified for the VUCC award on 24 GHz from this one contest--twice over. When the September, 2017 results were announced, N6NB had the highest rover scoree nationally with 158,040 points. K6MI had the #1 rover-unlimited score with 93,786 points. W6TE was second in rover-unlimited and N6MTS was third in the classic rover category. W6TV had the #4 multioperator score overall--and #1 on the west coast. The January, 2018 VHF Contest results were much the same. N6NB had the highest rover score nationally with just over 280K points, winning the classic rover category. W6TE was second nationally with 243K. In the unlimited rover category, K6MI was #1 nationally with a score of 264K and N6MTS was a very close second with 263K. The Southern California Contest Club won another gavel for the highest aggregate score in the medium club category. W6TV had the highest multioperator score on the west coast, setting a new January Pacific Division record. W6IT had the top single operator low power score on the west coast, setting a new Southwestern Division record. Both W6TV and W6IT worked the rover group on many bands in multiple grid squares enroute to their record scores. It was becoming clear by 2015 that climbing a ladder and then hoisting a "toolbox" station (a heavy and bulky three-dimensional object) onto a car roof wasn't getting any easier. I began looking for a way to set up 10-band rovers without any climbing. The result was senior-friendly "antenna-free" 10-band rover stations like the one shown at right and the one below. By 2016, I had built three of them. The one at right uses no exterior antennas at all and can be quickly installed on the passenger seat of almost any car. If the unit rests on something like a cardboard box, the antennas can be aimed out the passenger window. This entire station is housed in and on a 12 x 17 x 3" chassis. Five DB6NT transverters (for 1.2 GHz, 2.3 GHz, 3.4 GHz, 5.7 GHz and 10 GHz) are mounted inside the box along with many SMA relays for the necessary bandswitching. An FT-817 provides 50, 144 and 432 MHz plus the i.f. for the higher bands. An Alinco DJ-G29 HT provides 222 and 902 MHz. The system is fully wired for a DEMI transverter in lieu of the HT for 902, but that adds to the unit's weight and was never needed when this station was first used during the September, 2015 VHF Contest. The antennas are typical "rubber ducks" on the lower bands, with a WA5VJB log periodic for 902, 1.2, 2.3 and 3.4 GHz. That antenna also will work well on 5.7 GHz, but the dual-band 5.7 and 10 GHz dish was used for higher gain on those bands. The system has a Rubidium standard to assure frequency accuracy on the microwave bands. This is not the place for a full-blown construction article, but this system certainly played well on its September, 2015 maiden voyage. 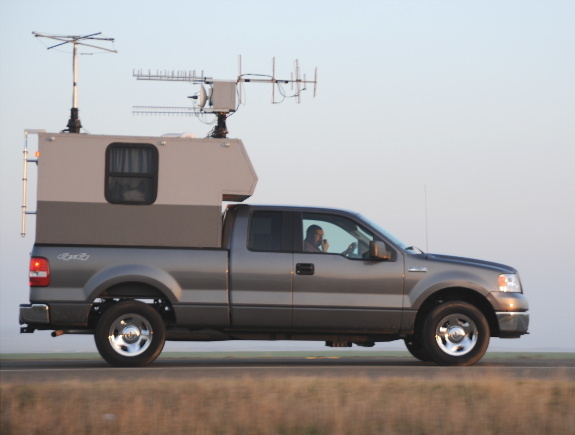 It worked everyone who could be worked with W6TE's elaborate rover with large exterior microwave antennas (the red Dodge truck shown elsewhere on this web page). Best of all, this package is something that a septuagenarian can carry with one hand (just grab the antenna "mast" and lift!). I devoted two weeks to building it in spring, 2015. That was time well spent. 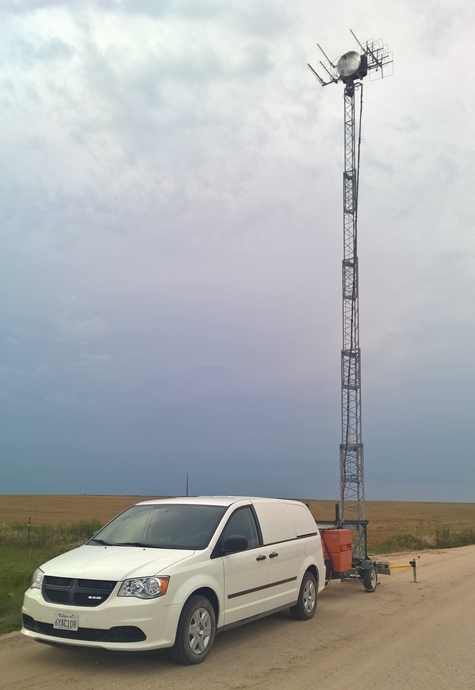 The people who used these "antenna-free" stations in September, 2015, did use external mobile whip antennas on 6, 2, 222 and 432, but these stations perform remarkably well with only the antennas shown in the photos. 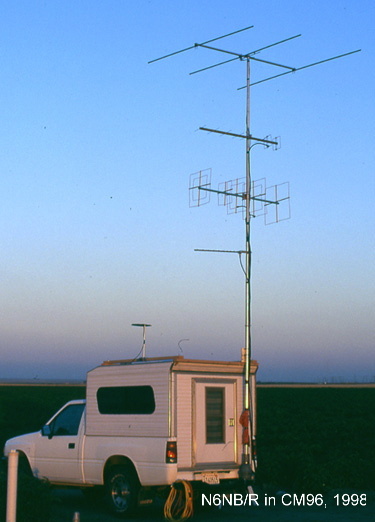 An earlier version of an "antenna-free" setup similar to this one was used in several previous contests, including the East Texas adventure of January, 2012, when it was used by K5FAY and KJ6CNO, an all-YL roving team. The 10-band station shown at left is larger and heavier than the one above. It uses Downeast Microwave transverters instead of the smaller and lighter weight DB6NT transverters. It is built on two 10 x 23 x 3" chassis with handles on each end to make the unit easier to carry. Yes, it does fit on a normal car seat. Most cars have more than 23" of clearance from the seat back to the dashboard to provide adequate knee room for tall passengers. Instead of an HT for 222 and 902, this station uses a 25-watt Alinco mobile transceiver for 222 and a low power DEMI transverter for 902. Other transverters inside the box cover 1.2, 2.3, 3.4, 5.7 and 10 GHz. As shown, it uses an FT-817 for 50, 144 and 432 plus the microwave i.f. However, a Yaesu FT-857 can be quickly substituted for the 817, providing 100 watts on six and 20 watts on 432. The two meter power has to be limited to 5 watts even with the 857 to avoid overdriving the transverters. Recipe for disaster #1 is to turn up the 857 to full power on two (50 watts), assuming that the operator will always remember to cut the power back to 5 watts every time the station is switched to a microwave band! If an operator really, really wants more power on two meters, a Mirage amplifier can be added to the system with extra relays to switch the 857 from the amp to the microwave i.f. line. In this higher power configuration, the station would always use external antennas on 6, 2, 222 and 432 (typically mag-mount whips on the car roof). The FT-817's "rubber duck" antenna will not handle more than about 10 watts. This larger station has a separate bandswitch box mounted on the Alinco 222 transceiver. There is only a current meter. The smaller station has separate meters for current and for relative power output on the microwave bands (a feature not available in this unit). It also differs from the one above in that it has no Rubidium standard. The operator must tune the i.f. as much as 20 kHz on some bands to be on the same frequency as the other (Rubidium-stabilized) 10-band systems. But aside from those differences, this station works exactly like the one above and even the larger toolbox stations. In all cases, the operator uses transceivers straight through on 50, 144, 222 and 432 MHz, then uses a bandswitch to rapidly run through the higher bands. Instant bandswitching has been a key feature of all of the 10-band stations. Without it, the large groups shown in earlier photos on this web page would never have been able to operate at the fast pace necessary for successful 10-band roving. By 2015, most of the group that did these roving adventures was, well, not young any longer. Several of the key players had observed their 70th birthdays, with others soon to follow. Sadly, seven of the rovers shown on these pages have passed away (see below). Perhaps the Southern California Contest Club will not again mount a roving effort as large as the biggest ones in 2009, 2010 and 2011. But we have a lot of good memories of the times we shared--and we had 14 club gavels as of early 2018. In addition to helping SCCC win club gavels, thirteen (13) different people who roved with the group have been national first-place winners in one or more rover categories. The #1 scorers have included: K6AH, K6FGV, K9JK, KG6TOA, KK6KK, K6MI, N6MU, N6NB, N6TEB, W6TAI, W6TE, W6XD and W6YLZ. Actually, a search of winning rovers who were SCCC members turns up a 14th call sign, KI6UZV. That was the call Carrie (W6TAI) held for 11 days when she was first licensed. As soon as her license was issued, she applied for W6TAI as a vanity call sign. It was granted the Monday after the January, 2009 contest. So she operated one contest as KI6UZV--and set a national record in the limited rover category with a call sign she was overjoyed to jettison the day after the contest. Here are six of the seven gavels won by the Southern California Contest Club in VHF contests between 2009 and 2011. Eastern clubs have won far more of these in VHF contests--the Mt. Airy VHF Club in Pennsylvania has more than 50 gavels in its collection. But no west coast club had managed to win even one gavel in a VHF contest until recently. A postscript: Phil Goetz, N6ZZ, one of the world's most respected contesters, passed away in early 2007, barely two years after his two-million-point rover expedition in Texas and New Mexico. Bob Mann, KK6KK, passed away in February, 2011. 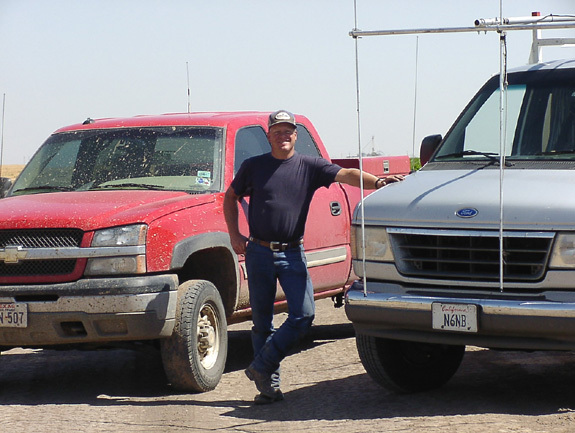 He was the #1 rover in the country during his last VHF contest (September, 2010). John Zapisek, K2MM, passed away in August, 2012. One of JZap's previous call signs, WA1MUG, became famous when it was used by the Mount Greylock contest group before the group adopted W2SZ, the club call sign of Rensselaer Polytechnic Institute. Larry Bettencourt, W6KYO (formerly WA6LUT) passed away in May, 2014. Larry excelled in his machine shop. He was one of the best craftsmen ever to build amateur radio hardware. Rob Hughes, KG6TOA, passed away in July, 2015. He roved with the group many times and was the only person in the group who got a license specifically to rove. Jan Whitteberry, WA6WTF, passed in July, 2017, ending the husband-wife roving (and life) partnership he shared with Carole, W6TTF. 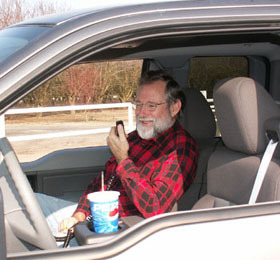 Ron Hunt, N6MTS, who enthusiastically joined the roving group for several contests in the mid-2010s, passed suddenly in December, 2018. 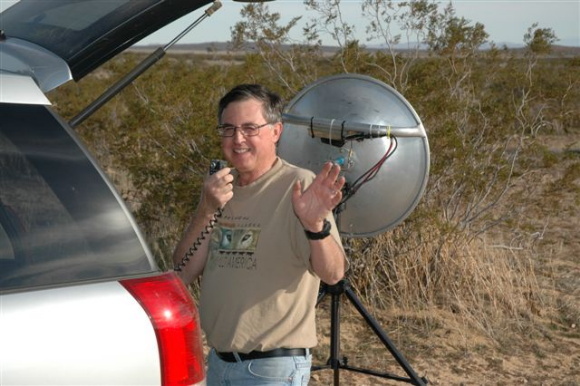 On a happier note, Marty Woll, N6VI, went on to become the vice director of the ARRL Southwestern Division in 2008. Art Goddard, W6XD, published a book on the history of Costa Mesa with his wife, Mary Ellen, and did speaking engagements and book signings as an author. Carrie Tai, W6TAI, moved from technician to general and then on to an amateur extra class license in the four months following her January, 2009 debut in amateur radio. Dave Smith, W6TE, headed up the Echoes of Apollo celebration to mark the 40th anniversary of the 1969 lunar landing by activating the 150-foot Stanford dish on 1296 MHz e.m.e.